As I told you in my last post, Stanley Rule & Level Company introduced the #110 non-adjustable block plane sometime in 1874. The plane was derived from Justus Traut’s patent No. 159,865 granted on February 16, 1875. Traut had sent in his patent application on November 13, 1874 at about the time Stanley started advertising the #110 block plane for sale. Traut’s patent shows a plane with the design characteristics of the first production model #110 block plane and a cutter adjustment mechanism. The cutter adjustment mechanism was the major claim Traut made in his patent (See Figure 1). Stanley was already selling the#110 non-adjustable block plane when Traut sent in his patent application. The #110 non-adjustable block plane was based on Birdsill Holly’s block plane as noted in my last web post which is available at http://eaiainfo.org/2016/12/26/copy-cat-blocks-and-one-from-the-model-shop/. 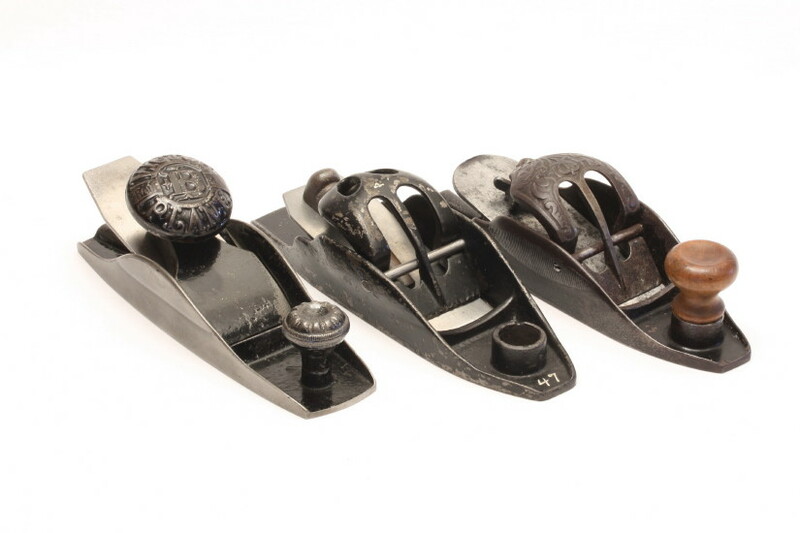 Holly never patented his block plane and Traut was free to essentially copy Holly’s design and sell the block plane without any fear of complaints or legal threats from Holly. So Traut’s patent claim did indeed apply to the cutter adjustment mechanism described in the patent. However, this cutter adjustment mechanism was never used on a production model of this plane. 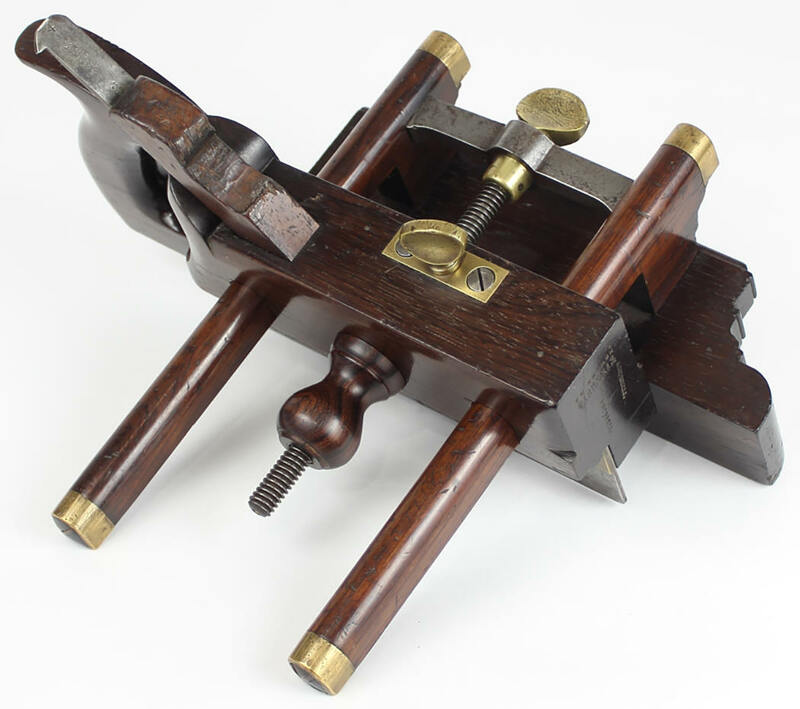 I suspect that there may be one out there somewhere from the Stanley Model Shop with Traut’s cutter adjustment as shown in his patent, and if so, I’d love to hear about it and see some pictures! Figure 2 shows the image found in the 1874 Stanley catalog of the #110 non-adjustable block plane. It is interesting to note that the image is of a Type 2 #110 block plane and not the Type 1 version as seen in the patent drawings. 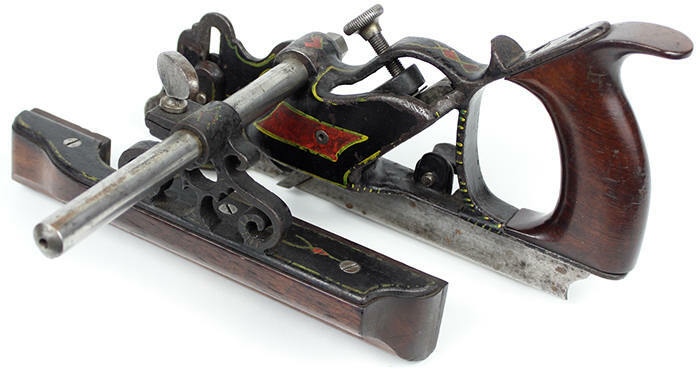 This suggests that the Type 1 version was made for a very short time, possibly only one casting run, and that Stanley may have been producing these planes in early 1874 and started selling them several months before Traut applied for his patent. 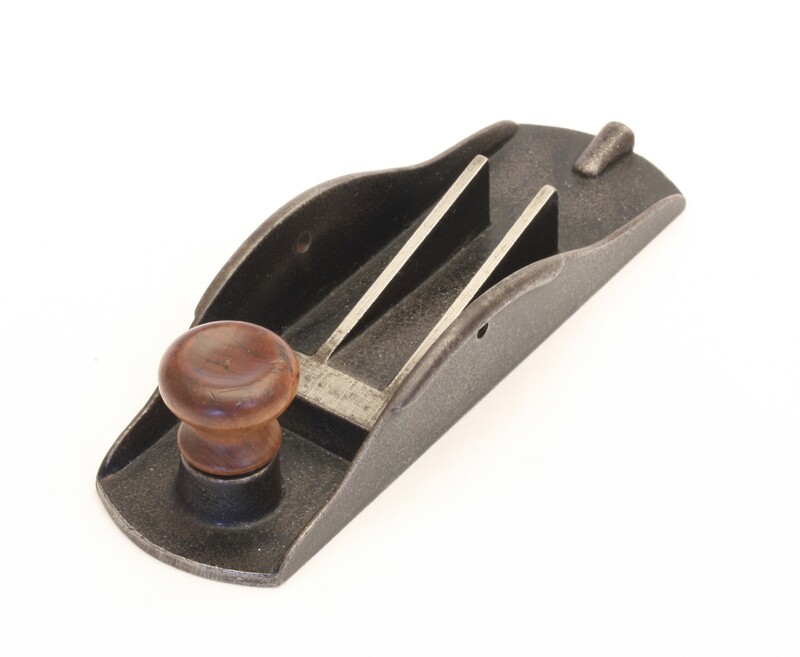 Figure 3 is an example of a Type 1 Stanley #110 block plane. The tapered boat shaped body is 7 3/8” long and 1 15/16” wide at the mouth. 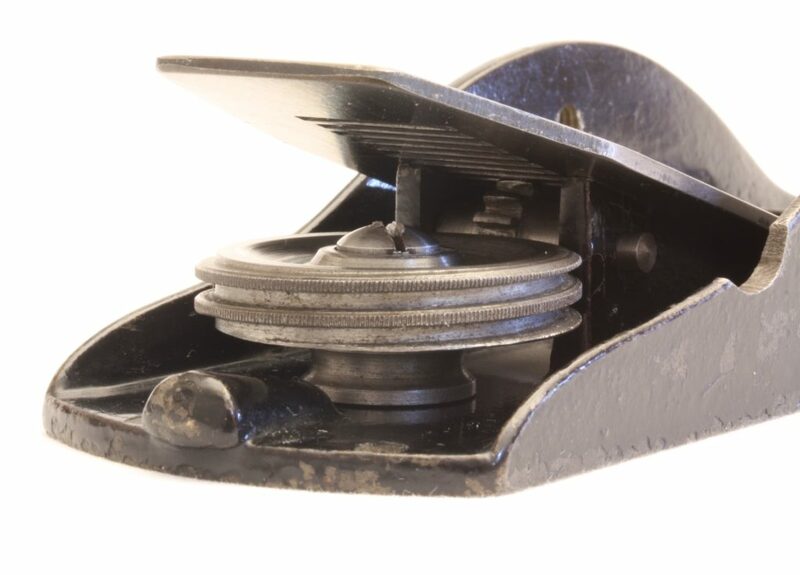 The “shoe buckle” lever cap is held captive by a steel rod that passes through the right sidewall of the plane (when viewed from the heel of the plane) and is screwed into a threaded hole on the left sidewall. The lever cap has a delightful filigree design on its upper surface. The lever cap adjusting screw is a steel screw with four wings (some examples are seen with a brass four wing adjusting screw). When the lever cap adjusting screw is tightened it secures the cutter in place and simultaneously applies pressure to the leading edge of the cutter via the front edge of the lever cap. The unmarked cutter with its semi-circular top is 1 and 5/8ths inches wide and is supported on a cross-rib cast in the bed of the plane (See Figure 4). A fruit wood front knob is friction fit into a raised cylindrical receiver which is cast onto the toe of the plane A raised lug rests on the heel of the plane and extends just a bit beyond the end of the plane bed. The gently flared side walls include raised vertical ribs to aid in gripping the plane. The lever cap and both the inside and outside of the body are japanned. 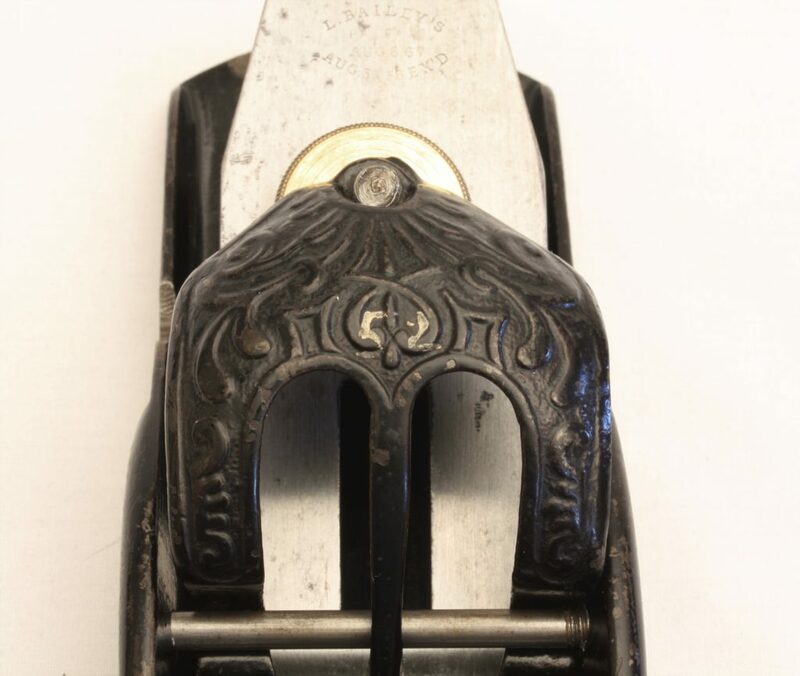 There are no marks on the plane or its cutter which would identify it as a Stanley product. This version of the #110 block plane was probably in production for less than six months. By mid-1875, the boat-shaped body was replaced by a plane with parallel sides (See Figure 5). This is the version of the plane shown in the 1874 Stanley catalog. The “shoe buckle” lever cap remains but the winged lever cap adjusting screw has been replaced by a coarsely knurled brass adjusting screw. The vertical ridges on the side walls are gone and replaced by reinforced ribs on the upper edge of the side walls. The cross-rib cutter support has been replaced by two wedge-shaped ribs that run parallel to the long axis of the plane (See Figure 6). The plane is slightly shorter at 7 and 5/16ths of an inch in length and slightly wider at 2 and 1/16ths of an inch. The cutter is still 1 and 5/8ths inches wide and has a semicircular top, but “Stanley Rule & Level Co.” has been stamped on the upper end. (See Figure 7). The raised lug on the heel of the plane is also slightly shorter than on the Type 1 version. Leonard Bailey left the employ of the Stanley Rule & Level Company on June 1st, 1875 to start his own competing plane manufacturing company. All the plane patents he’d licensed to Stanley in 1869 remained by contract with Stanley, so Justus Traut and the men in his workshop were free to make any improvements or modifications to Bailey’s planes or their own planes without fear of any arguments from Bailey, and they didn’t waste any time doing so! 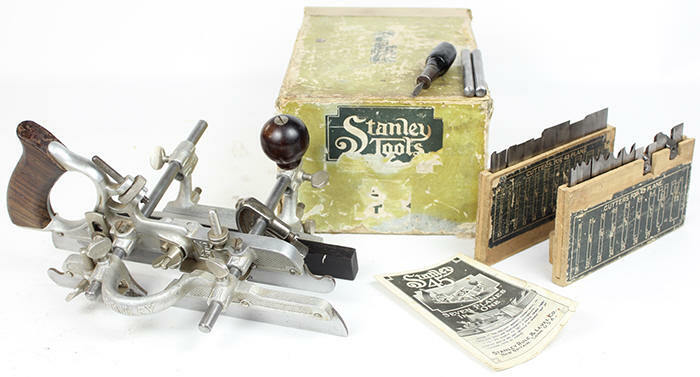 The plane shown in Figure 8 is from the Stanley Model Shop and is one of Traut’s attempts to create an adjustable Stanley #110 block plane. This appealing plane is in superb condition. The japanning is bright, the cutter has never been honed, and the sole of the plane looks as if it has never been run across a piece of wood. Curiously, it has Model Shop #51 painted on the toe and Model Shop #52 painted on the lever cap (See Figures 9 & 10). In my experience, Stanley Model Shop planes are labeled with only one number while this one has two consecutive numbers. We know that the Holly Block Plane I discussed in my last post carries Model Shop #47. We also know based on an article in The Fine Tool Journal that block planes #48 and #49 exist. The Model Shop tool #50’s whereabouts is not known and it might be a model of the plane shown in Traut’s patent drawing (Again, I’d love to see this one!). So, it is a mystery as to why this plane got two consecutive numbers instead of one, but the lever cap appears to have always been together with the body of the plane. 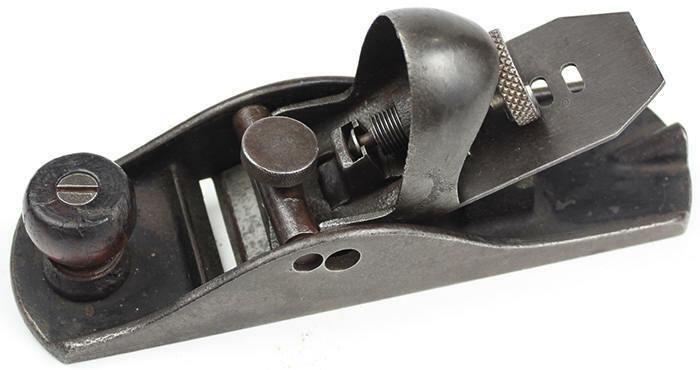 This plane has all of the same dimensions and characteristics of the Type 2 Stanley #110 block plane except for the ingenious cutter adjustment mechanism that’s been added to the heel of this plane (See Figure 11) and the use of a slotted cutter from a Bailey #9 ½ block plane. 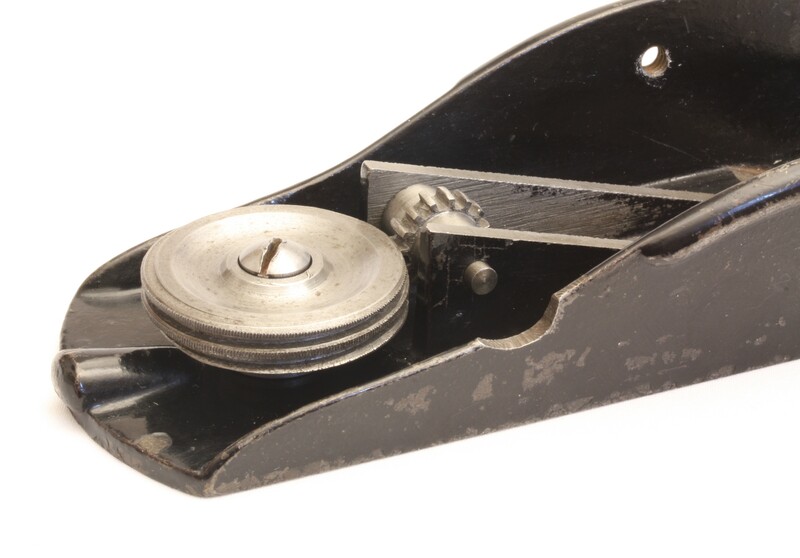 The style of the lever cap adjusting screw and the early Bailey cutter help to date this plane to mid-1875 to early 1876 which supports the premise that Traut and his workmen immediately started experimenting on adjustment mechanisms for the #110 block plane as soon as Bailey left Stanley. 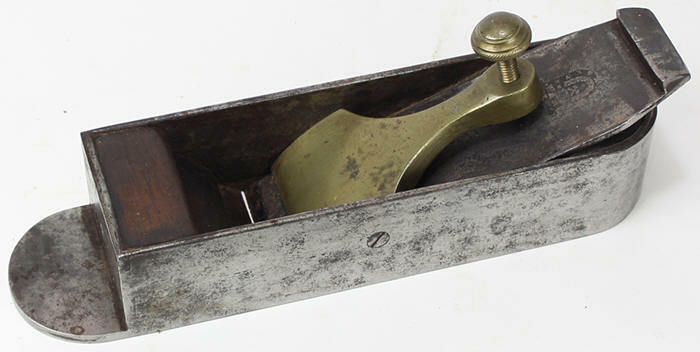 The front knob is missing and in fact there are no wear marks inside the cast cylinder on the toe of the plane which suggest that this plane may have never been fitted with a front knob. The cutter adjustment mechanism consists of a large 1½ inch diameter steel wheel which rotates freely on a partially threaded filletster head machine screw that is threaded into the sole of the plane (see Figure 12). 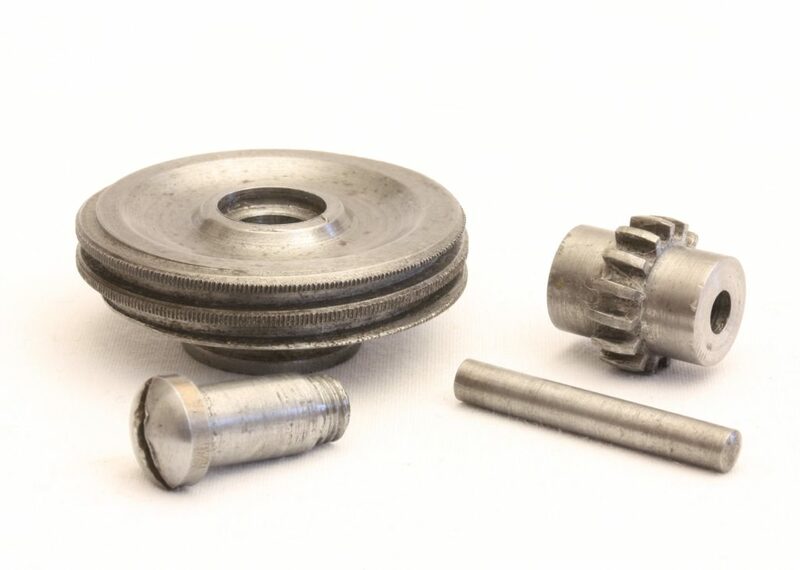 This steel wheel has a coarse thread cut into its finely ribbed edge. This coarse thread engages a cylindrical gear that is supported on a pin placed between the two wedge-shaped ribs that support the plane’s cutter. A small groove has been filed into the right sideboard of the plane to allow the insertion of the pin and the cylindrical gear. When the wheel is turned teeth on the gear are engaged in the coarse thread on the edge of the wheel while another of the gear’s teeth engages one of the slots cut into the back of the plane’s cutter. This combined motion of the wheel and the gear will either advance or withdraw the cutter (See Figures 13 and 14). 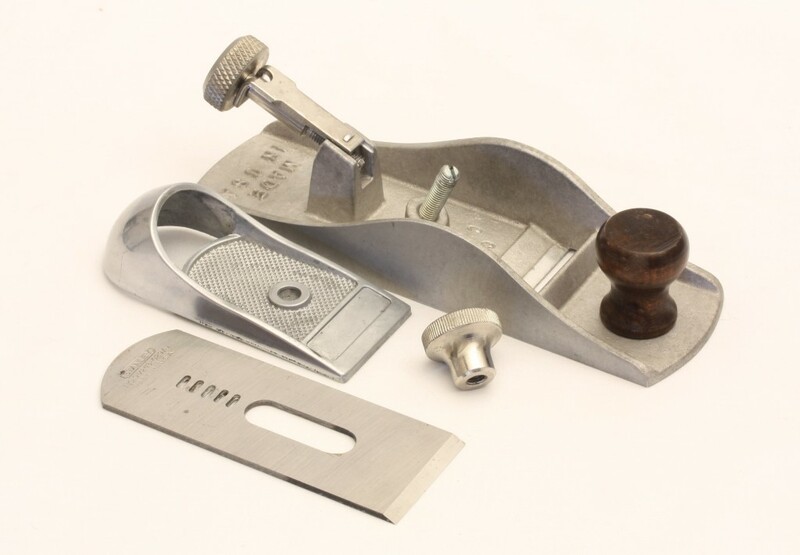 It’s a very elegant cutter adjustment design and works very well, but would have required a significant amount of precision machining and in the end offered no significant advantage over the cutter adjustment that was already in use on Bailey’s 9 ½ series block planes. There is no known patent associated with this cutter adjustment mechanism and it never made it into production. Instead, this fascinating plane was relegated to the shelves in the Model Shop until it made its way into a tool auction many years ago. There is one more #110 block plane from the Model Shop that didn’t find its way into my collection but also demonstrates another interesting attempt at a cutter adjustment mechanism. It is shown in Figure 15 and is discussed in Clarence Blanchard’s Fine Tool Journal article I mentioned above. Although the Model Shop number is unreadable, the lever cap adjusting screw is a four wing screw (made of brass) which suggest that this plane probably predates the one discussed above. The cutter adjustment mechanism consists of an “L” shaped bar and a vertically positioned wheel at the heel of the plane. The short arm of the “L” engages one of the slots cut into the back of the cutter. 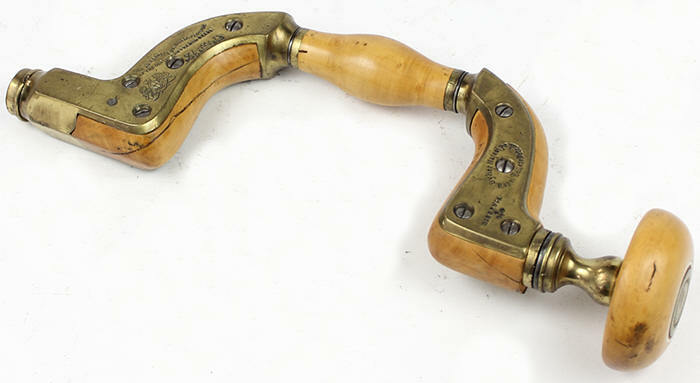 The long arm of the “L” is attached to the wheel that is fixed vertically to the heel of the plane. 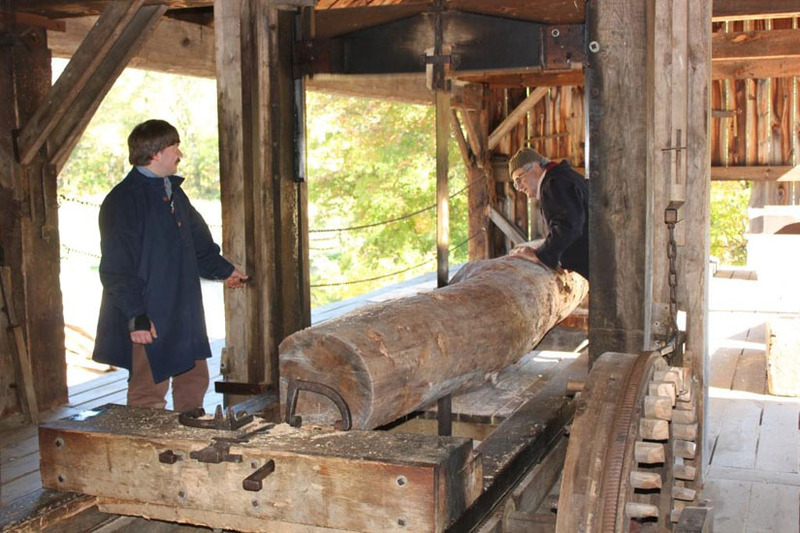 As the wheel is turned, the bar moves up or down moving the cutter in or out of the mouth of the plane. 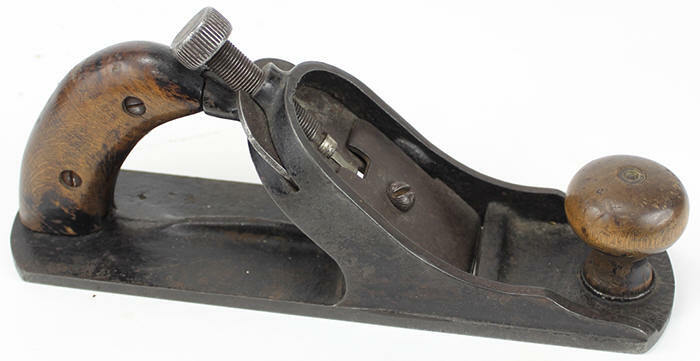 This too is an interesting method of cutter adjustment, but there is no known associated patent and this plane also spent most of its life in the Model Shop until it too found its way into a tool auction. All of these cutter adjustment ideas were “food for thought” in Traut’s workshop. It is conceivable that these two planes were experiments in designing a cutter adjustment mechanism but were discarded in favor of the mechanism shown and described in Traut’s patent. Justus Traut appears to have been intent on producing an adjustable block plane of his own to rival Bailey’s #9 ½ so that he too could reap the economic benefits associated with an adjustable block plane. 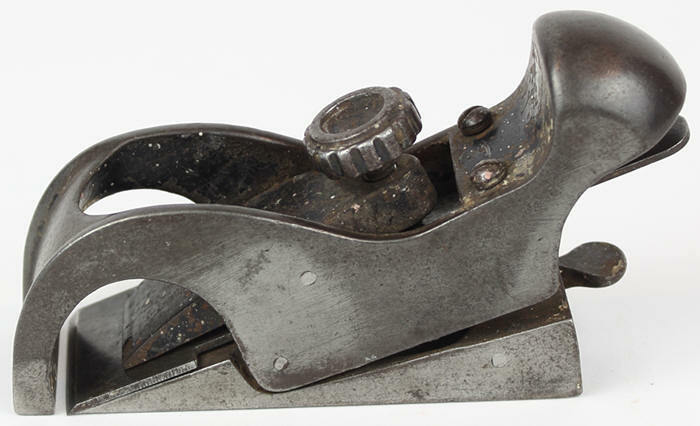 Traut persisted and next time I’ll tell you how later in 1876 his Stanley #110 non-adjustable block plane was adapted to become the Stanley #120 “adjustable” block plane. Some of the early versions of this plane for a very short time (early to mid-1875) had a lever cap adjusting screw that consisted of two pieces, a filletster head machine screw and a circular brass disk locked onto the filletster head screw. See adjacent photograph. 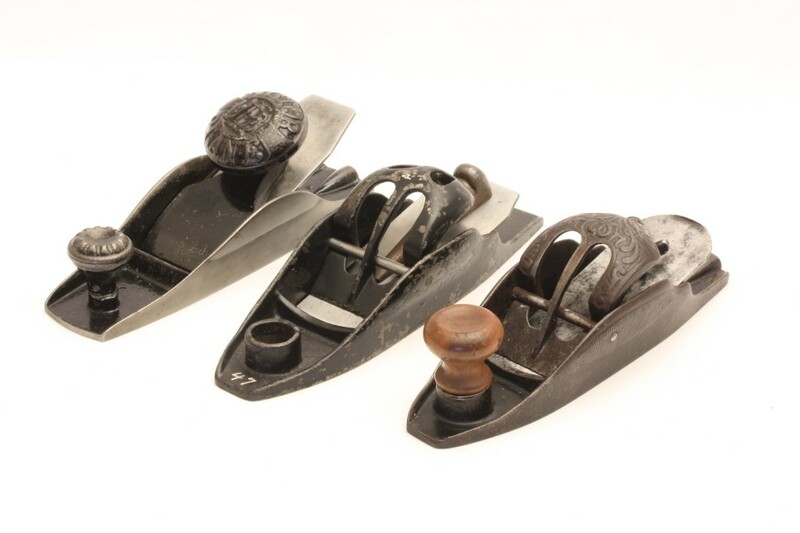 Other cutter seen on these early versions of the #110 block plane have a semicircular trademark stamped in them which reads “Stanley Rule & Level Co.” The Stanley #110 continued to evolve. For further information look up the excellent type study put together by John G. Wells entitled “Early Models of the Stanley No. 110 Block Plane: 1874-1887”. It was first published in The Gristmill, Number 81, December 1995, pp. 10-14. Blanchard, Clarence, “Birdsill Holly and the Stanley Rule & Level Co.”, The Fine Tool Journal, Volume 57, No. 2, Fall 2007, pp. 20-23. The numbering system used over the years in the Stanley Model Shop is a mystery. At times, it appears logical and sequential, at other times it appears totally random. I look forward to the day when someone can make sense of it all! Sales figures for 1876 indicate that Stanley sold 7,000 #9 ½ and 1,406 #9 ¾ Bailey block planes in 1876. Royalties were paid to Bailey based on the number of planes sold so Traut would have had a strong financial incentive to create a plane that could compete with Bailey’s so his royalty payments would increase. 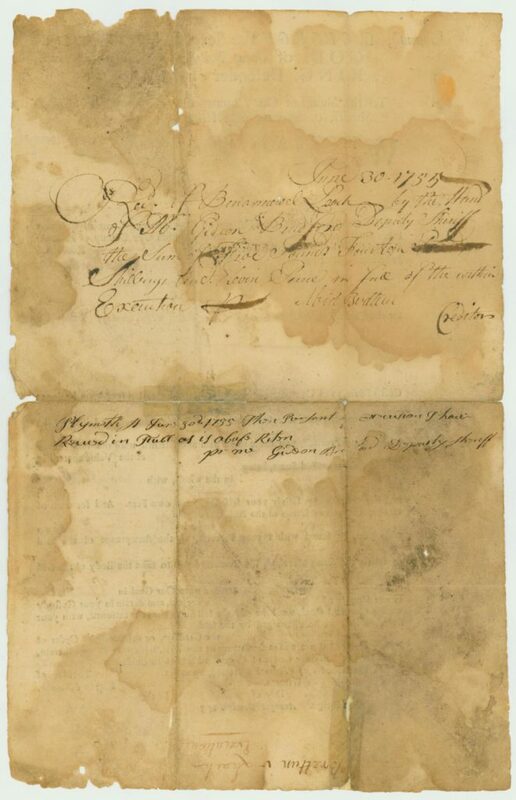 This post presents documents and deeds relating to Early American woodworking trades and craftsmen and covers Plymouth County, Massachusetts. Bristol, Middlesex and Essex Counties of Massachusetts were covered previously. These documents cover nearly 100 years, from Queen Anne to King George the 2nd to President George Washington. Each of the documents provides a name, a profession, a place and a time. Take note of the 1740 Stetson document as it probably links to the family of the planemaker Jonah Stetson. 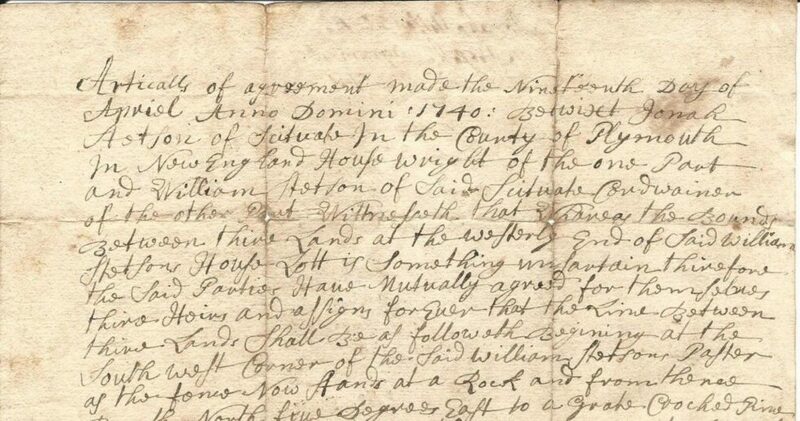 Also, two of the documents, while relating to court cases, provide contract details of barn and house construction … one as early as 1702. 1. The original spelling and capitalization is retained if possible. 2. If the spelling or interpretation of a name is questioned, that entry is set apart using (parenthesis). Table Note: NS denotes “not signed” and S denotes “signed”. 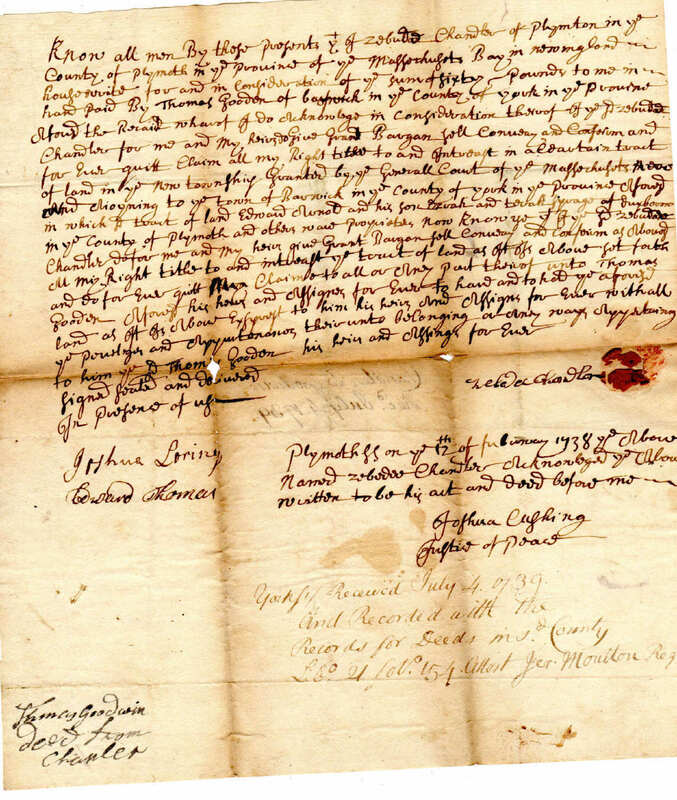 1714 A court document to the sherriff of Barnstable County commanding the attachment of the goods of Matthew Fuller, Barnstable, in a case brought by Thomas Lambert of Situatt, Plymouth County, house carpenter. 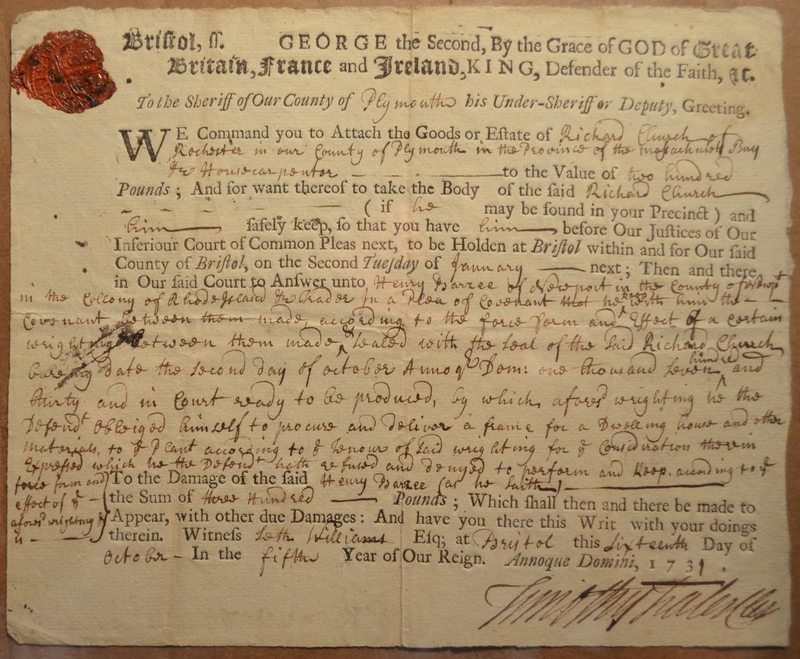 The case references the summer of 1702 in which Thomas “gott the frame of a barn”, transported it and set it up for the defendant along with a stable. The barn frame measured 20 feet by 20 feet and additional “bords” and shingles were provided by Lambert. Witness John Cushing. Signed by the clerk William Little and the sheriff Shuball Gorham. 1714 Thomas Lambert of Sittuat, house carpenter. 1731 Richard Church of Rochester, Plymouth County, House carpenter the defendant and Henry Barree of Newport, Trader the plaintiff for 200 pounds. In 1730 Henry had contracted with Richard to “procure and deliver a frame for a Dwelling house and other materials”. 1731 Richard Church of Rochester, House carpenter. 1737 Another court case! Joseph Blackmer of Rochester, millwright and John Blackmer of Tiverton, husbandman in a case of 270 pound debt decided in favor of Christopher Almy of Newport, merchant. Witnessed by Seth Williams and signed by Timothy Fales, clerk. 1737 Joseph Blackmer of Rochester, millwright. 1738 Zebadee Chandler, of Plymouth, house wright sells a tract of land in Barwick in the County of York to Thomas Gooden of Barwick. Edward and Ezrah Arnold are mentioned. Signed by Zebadee, Joshua Loring, Edward Thomas, Joshua Cushing JP and Jer Moulton Reg. 1738 Zebadee Chandler of Plymouth, house wright. 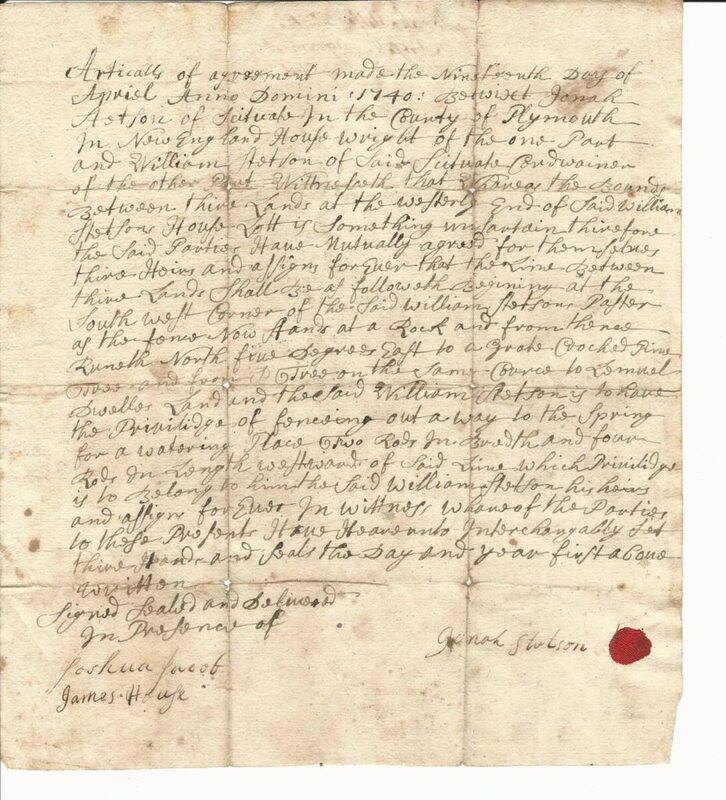 1738 deed in which Job Otis of Scituate, shop keeper, sells 6 acres plus of land in Hanover to Richard Hill of Hanover, House wright. Mentioned in the land description are Mitchell Wanton and Richard Bowkers. Signed by Job, Joseph House, Caleb Torrey and Elijah Cushing JP. 1738 Richard Hill of Hanover, House wright. 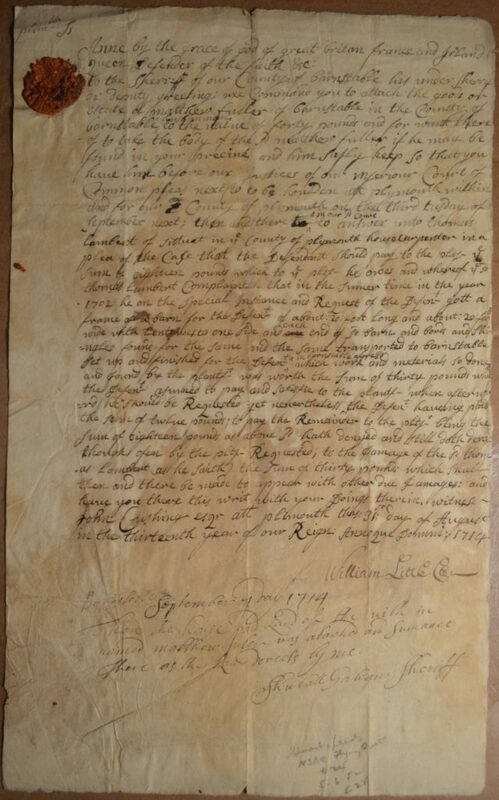 1740 Jonah Stetson of Scituate, House wright, agreement with William Stetson of Scituate, Cordwainer, that the line between their lands be clearly identified and access to a spring specified. Lemuel Dwelles is mentioned in the land description. 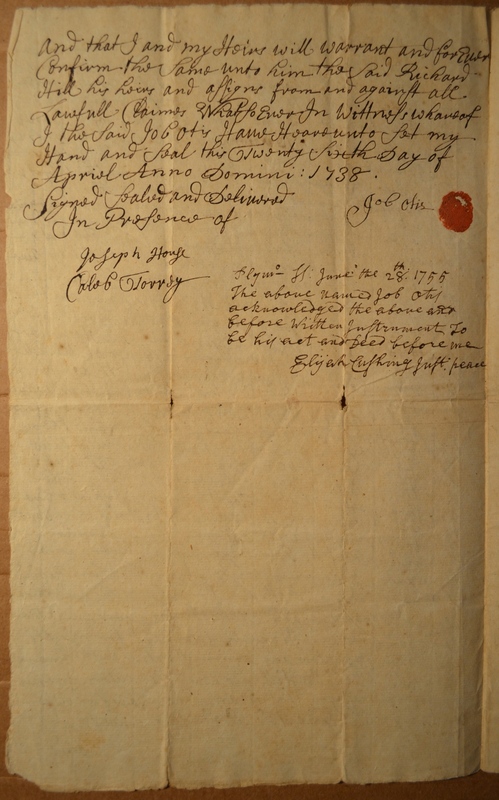 The deed is signed by Joshua Jacob, James House and Jonah Stetson. In AWP 4th edition by Thomas Elliott, planes made by Jonah Stetson are thought to have been made by the Jonah born in 1722 and / or his son born in 1761. 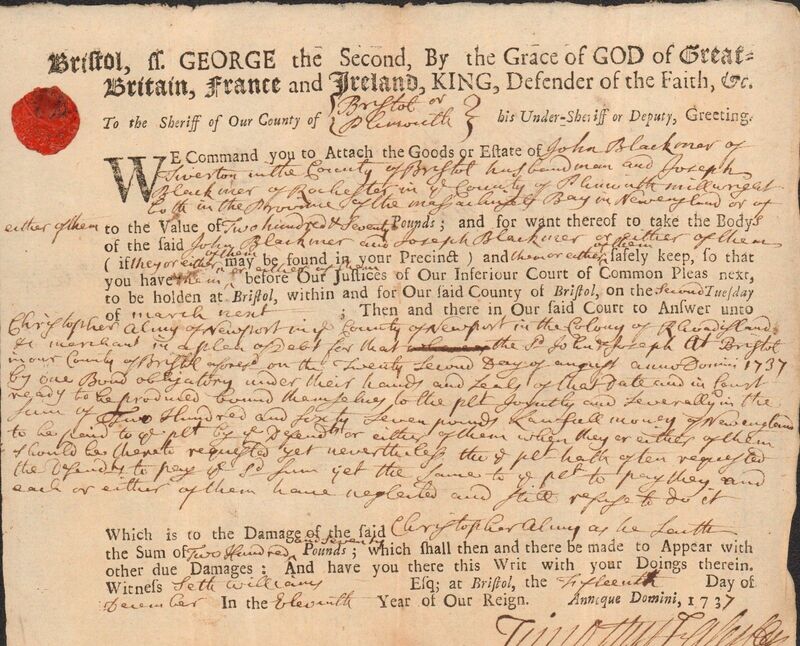 Based on the 1740 date of this document, the Jonah born in 1722 was probably not the signatory. Instead, it was probably his father who was born in 1691. 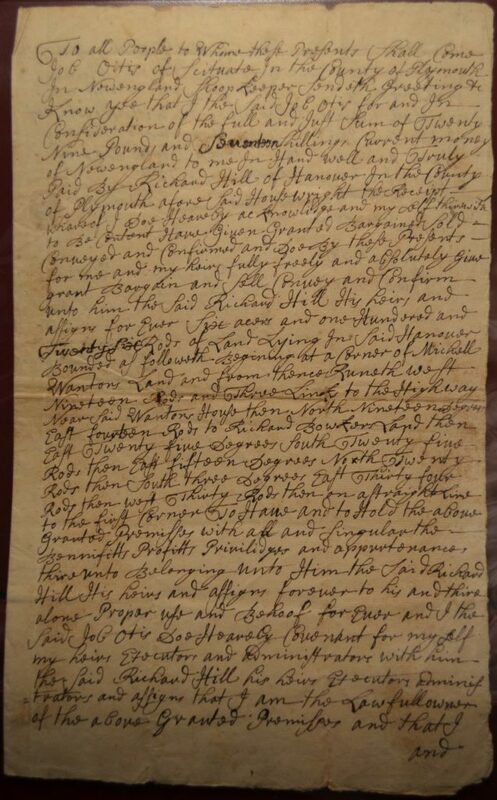 It is interesting to note that another deed from the 1690’s surfaced about the time this one was found and it is signed by Samuel Stetson, the father of the 1691 Jonah. 9 3/4″ by 8 5/8″. 1740 Jonah Stetson of Scituate, House wright. 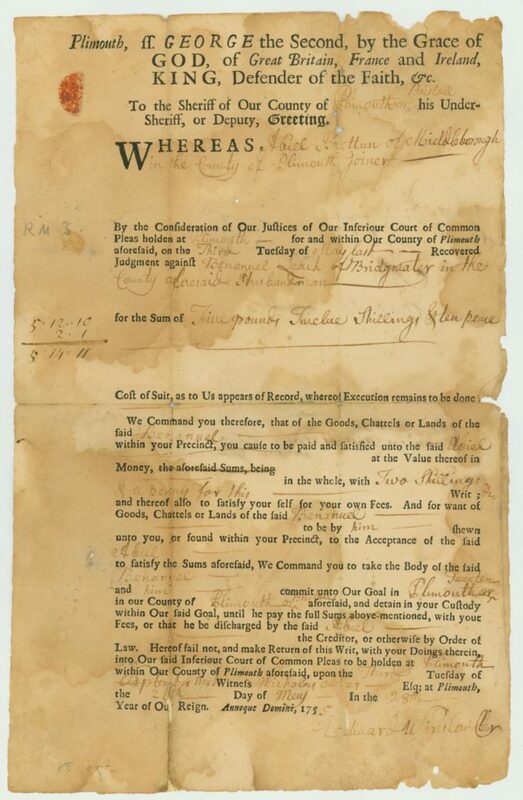 1755 Abiel Brettun of Middleborough, Joiner has obtained a judgement against Benanuel Leach of Bridgewater, Husbandman for the sum of 5 pounds 12 shillings and 10 pence. Witnessed by Nicholas Cotes and signed by Edward Winslow Cler. Sheriff Gideon Bradford and Abiel Brettun sign on the reverse. 12 1/4″ by 7 3/4″. 1755 Abiel Brettun of Middleborough, Joiner. 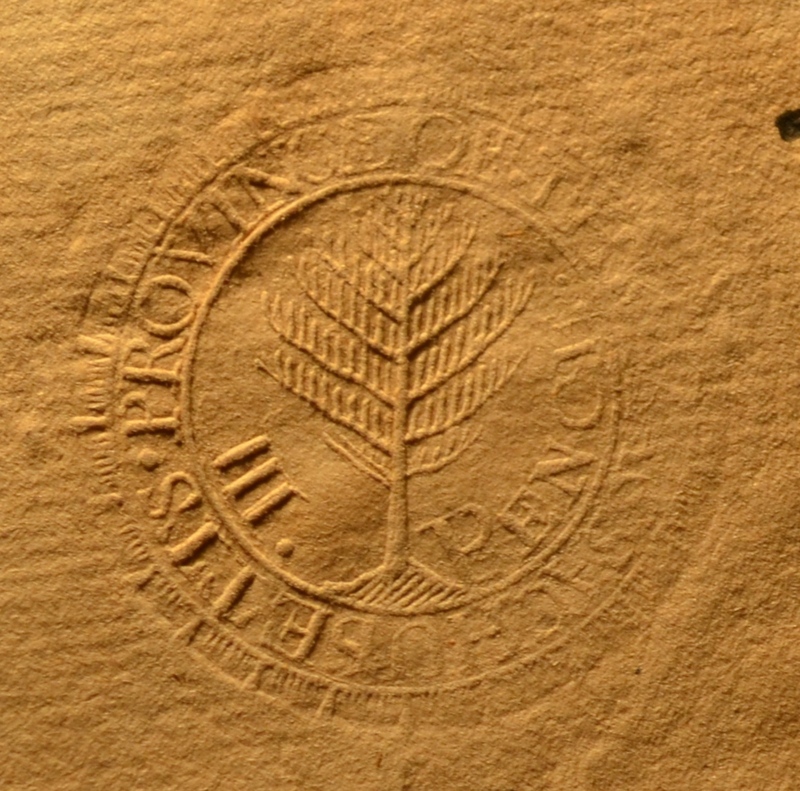 1755 Abiel Brettun of Middleborough, Joiner, tax stamp detail. 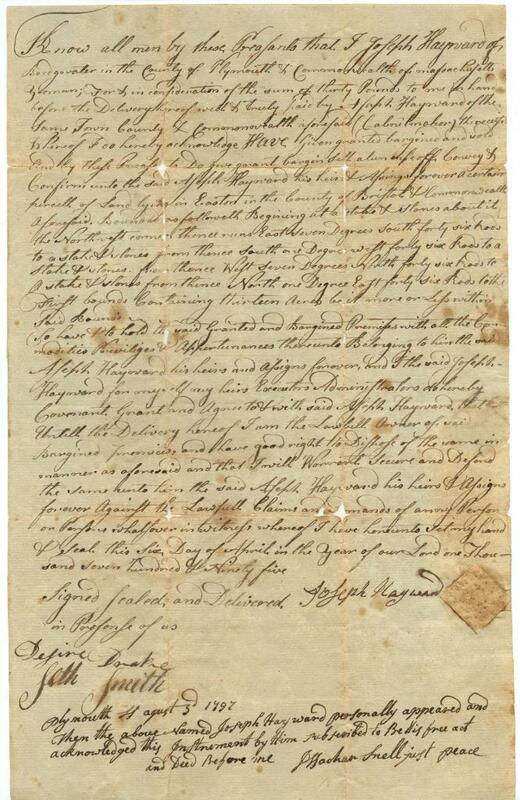 1795 Joseph Hayward of Bridgewater, yeoman sells land in Easton to Aseph Hayward of Bridgewater, Cabinetmaker. Signed by Joseph Hayward and witnessed by Desire Drake and Seth Smith. Also signed by Issachar Snell JP. 1795 Aseph Hayward of Bridgewater, Cabinetmaker. When I’m asked about hobbies and responds with “weaving” or “spinning,” there is usually a silence and/or a quizzical look. Recently, someone tried to explain to me that I could buy dishtowels at Walmart and wouldn’t that be easier? A response to “spinning” is usually, WHY? OK. There is a disconnect there and I am used to dealing with that. A new response I’m hearing, especially to “weaving,” is “How do I get into that?” and “When did you get started?” This is the stepping off point for anyone who enjoys sharing their particular interest and, especially, getting someone else started on the path. So how did I get started? Lots of weavers and spinners got started in the 70’s in the “back to the land” movement. Yeah, I was there but my avenue to the “land” was cooking and assorted housekeeping things. Not artsy or creative for the most part. Eight years ago, when our daughter was expecting our first grandchild, I had a desire to knit for this baby. I had learned to crochet as a small child from my grandmother but had only accomplished a few afghans (in the 80’s) and put it down. Now I really wanted to learn to knit. I went to classes (most important for beginning in a craft) started to hang out in a knitters group. I was fascinated by the variety of yarns and wondered how this was done. That led into spinning and joining a weaving/spinning guild. Spinners there got me started with basic instructions and the guild rented me a wheel. I was hooked immediately. Creating anything is a big deal for me. Writing a story, baking a perfect pie, crafting a garment….something out of bits and pieces, folded around an idea and shaped into a new object. Wow. Soon a free loom came into the guild and eventually to me. Now I was weaving rugs and fabrics. Knitting scarves and sweaters. Out of yarn. MY HANDMADE YARNS. This was getting down to the essence of crafting and creating. How d0 you get started? The nuts and bolts of it is really in seeking out both equipment and teachers. Some of my teachers were just friends who generously gave me their time and showed me the steps as I was ready to accomplish them. 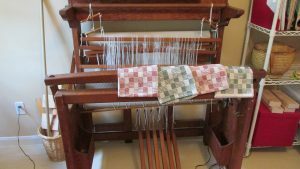 Guilds and organizations usually have both instructors and rental equipment so you can get started without the big commitment of buying a wheel or loom. Reading books and surfing the internet are great but the support and contact of crafters and hands on instructors is what continues to pass me on through the steps of learning. I participate in a local spinning/weaving guild and take classes at my favorite yarn shops. I even do demonstrating at fairs and shows occasionally. I meet lots of folks who are interested in fiber arts and, hopefully, I can spur one on to putting a hand in. On July 6, 1852, Birdsill Holly was granted Patent No. 9,094 for a cast iron bench plane. 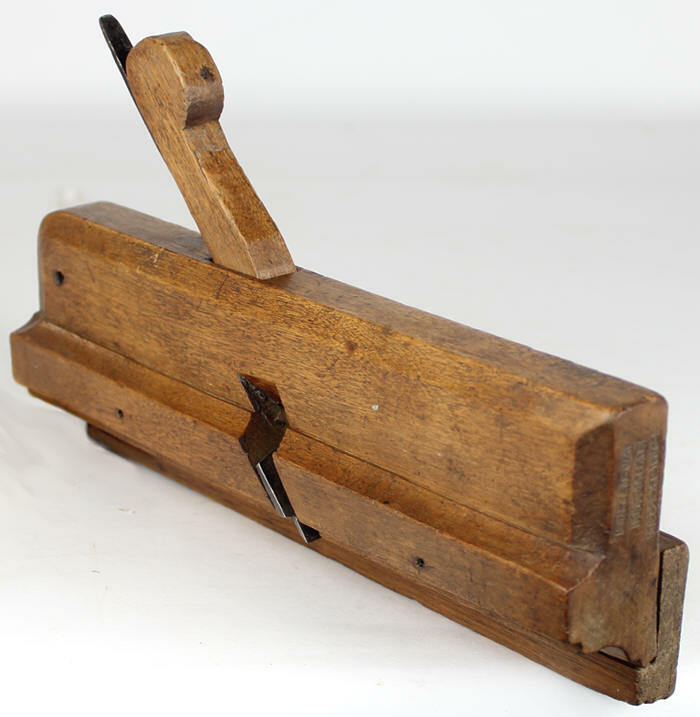 In addition to his cast iron bench planes he produced and sold two models of a cast iron block plane. There are no individual patents for these block planes and they were manufactured for only about 8 years probably between 1851 and 1859. Two versions of his cast iron block plane are known. One of the variations on the Holly block plane is shown in Figure 1. This 7 ¾ inch long plane is probably the first version of Holly’s block plane. Figure 1. The First Version of Birdsill Holly’s Cast Iron Block Plane. Photo Courtesy of Jim Bode Tools. Figure 2 shows the second and more commonly seen version of Holly’s block plane. This unused Holly block plane is from the Stanley Model Shop and has the Model Shop number “47” painted on the toe and the lever cap. It too is 7 ¾ inches long like the first version and is 2 and 1/16ths inches wide at the mouth. It has an attractive “boat tail” shape and is more narrowed at the heel of the plane than the first version. 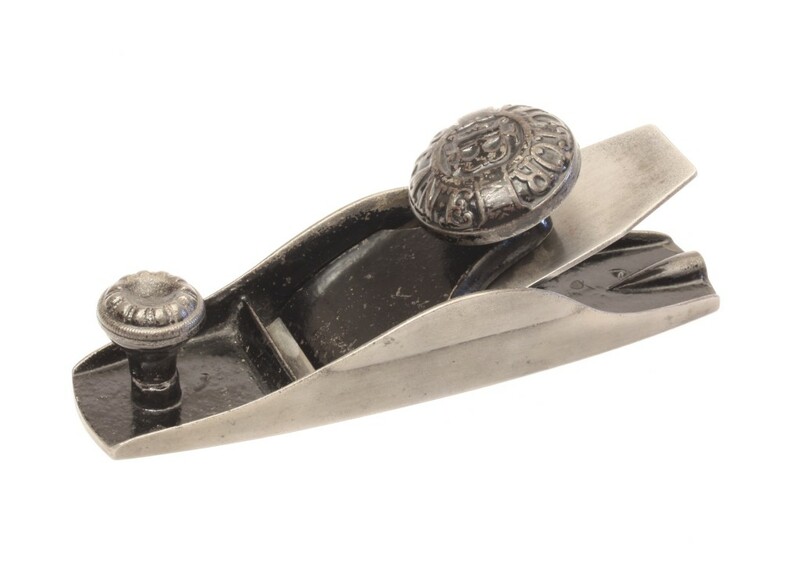 The captive “shoe buckle” lever cap is held in place by a pin driven through two holes in the sidewalls of the plane. 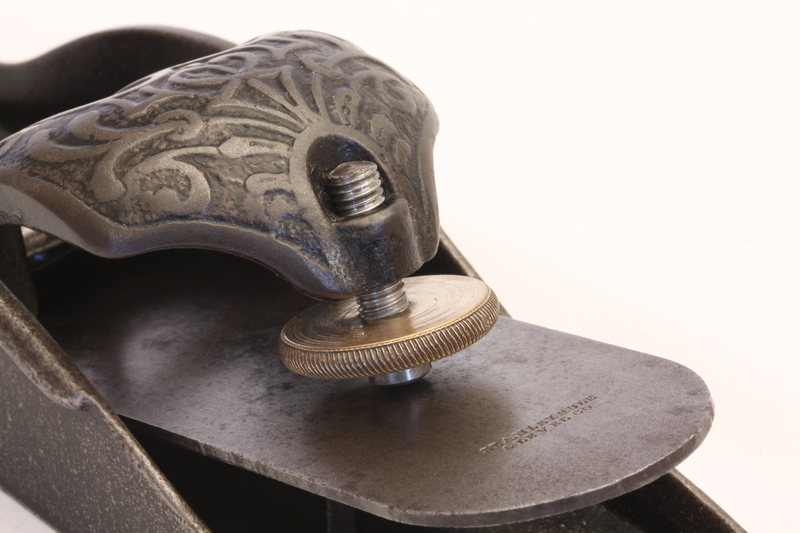 The unmarked cutter has squared off corners and is supported on a raised casting 2 ¼ inches from the heel of the plane. 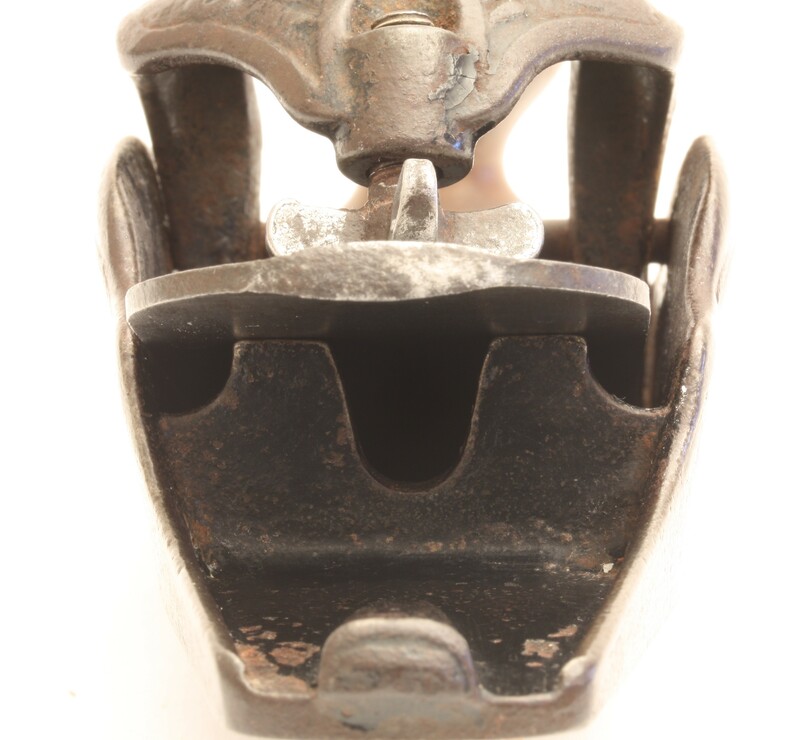 A cast iron “horseshoe nail” wedge is placed between the upper surface of the cutter and the under surface of the captive “shoe buckle” lever cap. There are the remnants of a copper wash on the surface of the “horseshoe nail” wedge. Figure 2. Birdsill Holly’s Block Plane from the Stanley Model Shop. On many examples of these block planes, the metal wedge has been lost and had been replaced by a wooden wedge. The cutter’s depth of cut is adjusted by hand and the wedge-shaped pin is then pushed into position wedging the cutter in place and at the same time causing the front edge of the lever cap to apply pressure toward the front edge of the cutter (See Figure 3). The wooden front knob would have been simply pressure fitted into the round raised boss on the toe of the plane, but unfortunately, that is missing. The casting is of high quality and about 80-90% of the japanning remains on the plane. It’s a mystery how this unused version of a Holly block plane came to reside in the Stanley Model Shop more than 10 years after Holly stopped producing planes. Figure 3. Birdsill Holly Block Plane Rear View. Note the ‘Horeshoe Nail” Wedge that is Pushed Under the “Shoe Buckle” Lever Cap. A Small Amount of Copper Wash Remains on the Wedge. 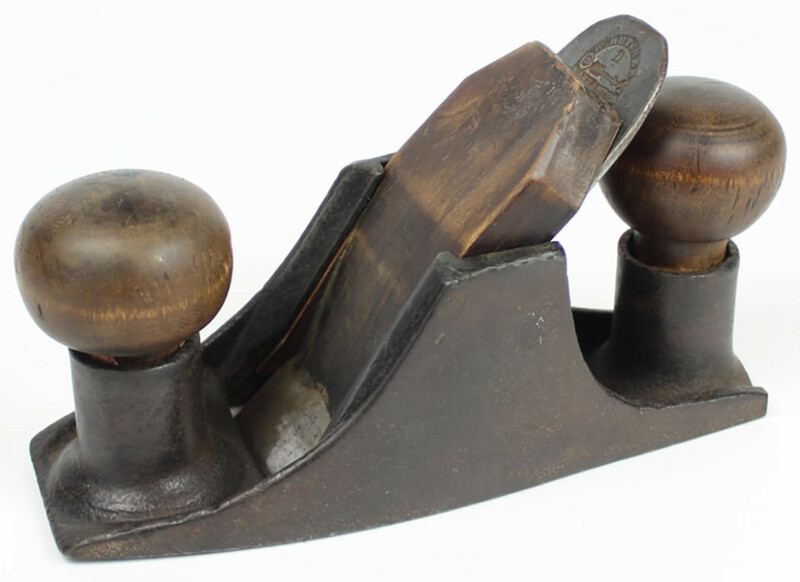 Holly’s block plane from the Stanley Model Shop captured the attention of two of the major inventors at Stanley in the years between 1869 and 1874; Leonard Bailey and Justus Traut. Both of them “copied” or maybe a better word is “appropriated” Holly’s design for their own block plane designs. Since there are no patents known that apply to Holly’s block plane and since he was no longer manufacturing them, and his 1852 patent had expired by 1869, both of these men could incorporate aspects of Holly’s planes into their own block planes without having to face any legal or economic consequences. Leonard Bailey sold his plane business to the Stanley Rule & Level Company in 1869 and was hired by Stanley to manufacture his planes for them. He supervised the plane “shop” with his own group of employees. 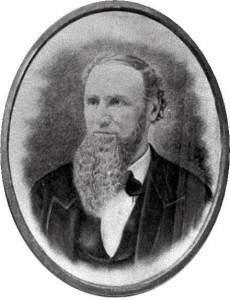 Justus Traut had been a Stanley employee since the mid 1850’s and was an accomplished inventor and mechanic like Bailey. He also ran his own “shop” with his group of loyal employees at Stanley . Almost from day one, Bailey and the management at Stanley had a contentious relationship, particularly in regards to the royalties he was being paid on his plane patents and his desire for total control of Stanley’s woodworking plane production. 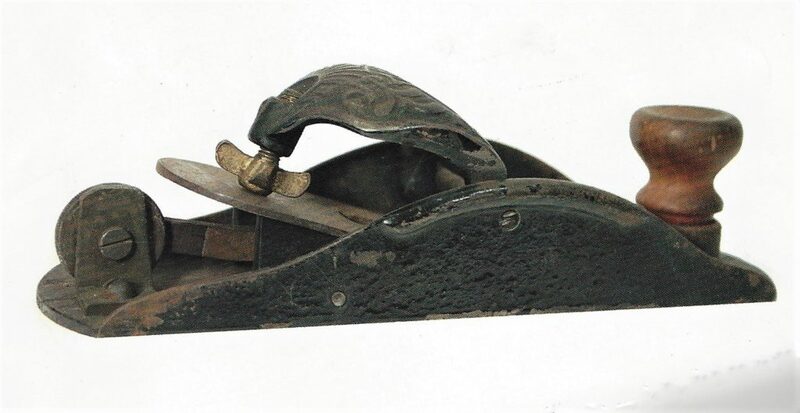 Bailey had developed his #9 ½ block plane in 1871 and Stanley first offered it for sale in their 1872 catalog (See Figure 4). Figure 4. Leonard Bailey’s #91/2 Block Plane. Type 1 in Foreground, Type 3 in Rear. Manufactured at Stanley Rule & Level Company. This first version of the 9 ½ utilized a lever and eccentric pin cutter adjustment based on Bailey’s June 22, 1858 patent No. 20,615. 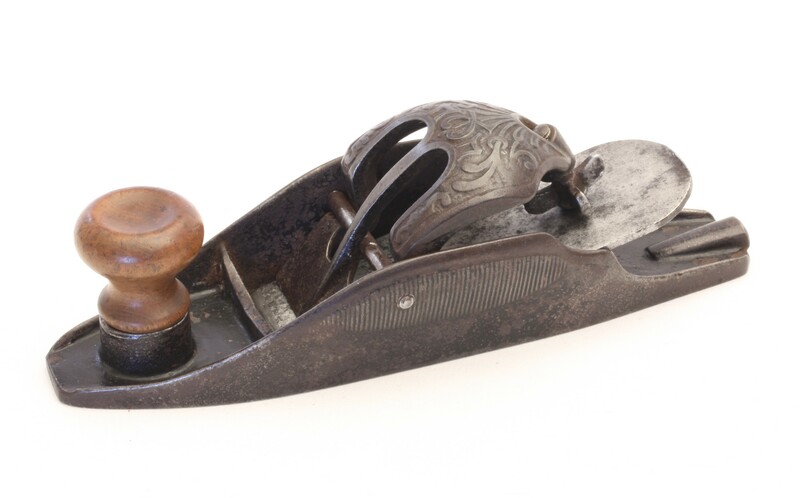 By 1875 Bailey had modified the 9 ½ block plane and incorporated a cutter adjuster that consisted of a right hand threaded vertical post with a brass thumb wheel and a forked wrench shaped adjusting lever. This adjustment mechanism is based on Bailey’s patent No. 67,398 of August 6, 1867. The plane worked extremely well and sold very well. In an attempt to garner a larger share of the growing block plane market Stanley wanted to introduce a lower cost non-adjustable block plane for the casual user and hobbyist. They asked Justus Traut to develop this plane rather than Leonard Bailey. Traut proceeded to essentially copy Holly’s block plane with minor modifications. He filed a patent application on November 13, 1874, and was granted patent, No. 159,865 on February 16, 1875, which describes a cutter adjustment mechanism that is mechanically very similar to the cutter adjuster Bailey had patented on June 22, 1858 (See Figure 5). 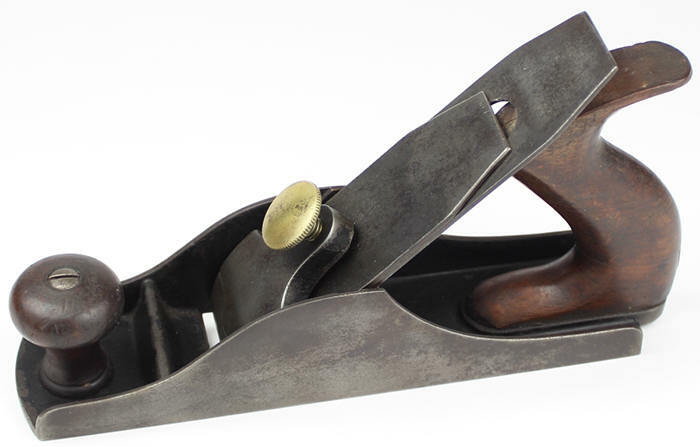 Possibly because of this similarity in cutter adjustments Stanley decided not to produce Traut’s block plane as described in the patent, but instead introduced Traut’s block plane as a non-adjustable block plane, the #110 Block Plane in the fall of 1874 (a few months before his patent was granted). It cost 75 cents compared to two dollars for the Bailey No 9 ½ Block Plane. 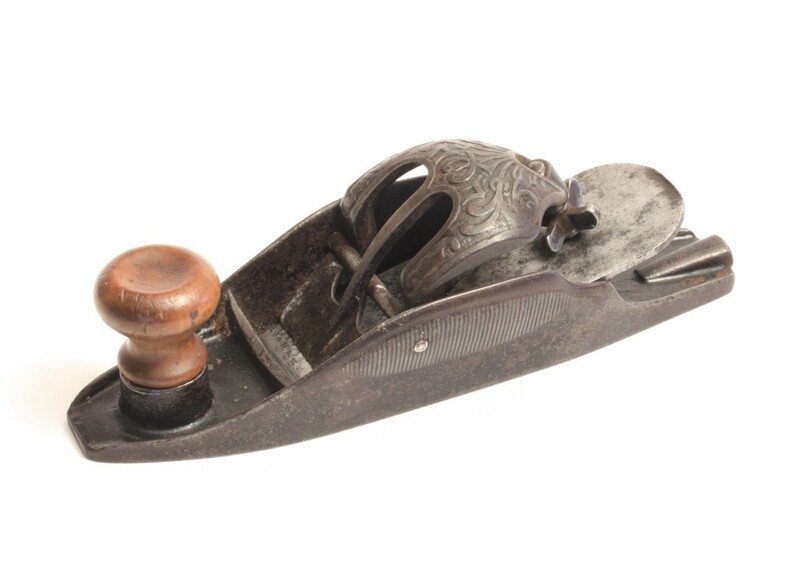 The plane shown in Figure 6 is an example of the #110 block plane as sold by Stanley in 1874. This plane is 7 3/8” long compared to the 7 ¾ inch Holly block plane and 1 and 15/16ths inches wide at the mouth. The 1 5/8ths inches wide cutter is unmarked and has a round top. The front knob is turned fruit wood and is friction fit into the round raised receiver on the toe of the plane. Traut added some vertical ribs to the sidewalls, a raised reinforcing nib at the tail, a nice filigree design to the lever cap, and replaced the “horse shoe nail” wedge with a winged adjusting nut, but, it is essentially the same plane as Holly’s. Figure 6. 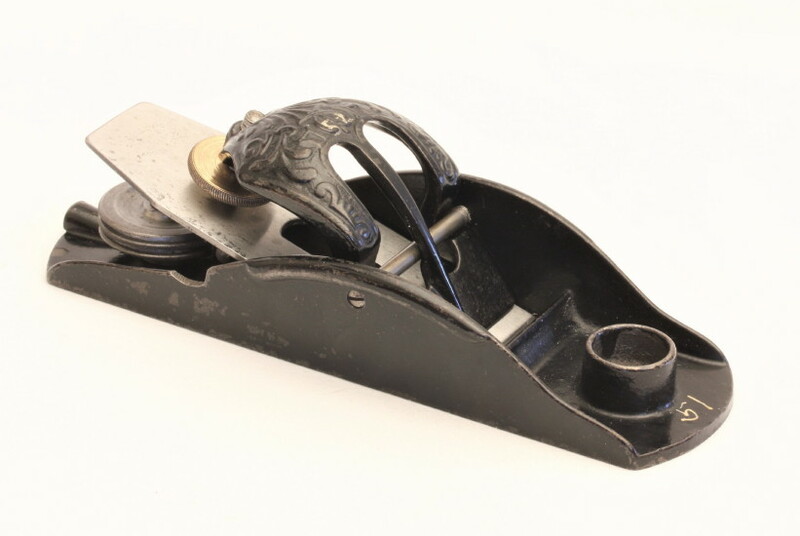 Stanley #110 Block Plane Type 1 c. 1874, designed by Justus Traut. Note the vertical ribs on the side walls and the filigree design on the “shoe buckle” lever cap. The introduction of this plane by Stanley infuriated Leonard Bailey and contributed to his decision to leave Stanley on June 1, 1875, and strike out on his own. Bailey had been contemplating this move for some time and had been laying the ground work for his exit from Stanley and the establishment of his new business, Leonard Bailey & Company, in Hartford, Connecticut. Under his contract agreement with Stanley he couldn’t take his plane designs and patents with him, so he had quietly been working to develop a whole new line of planes. 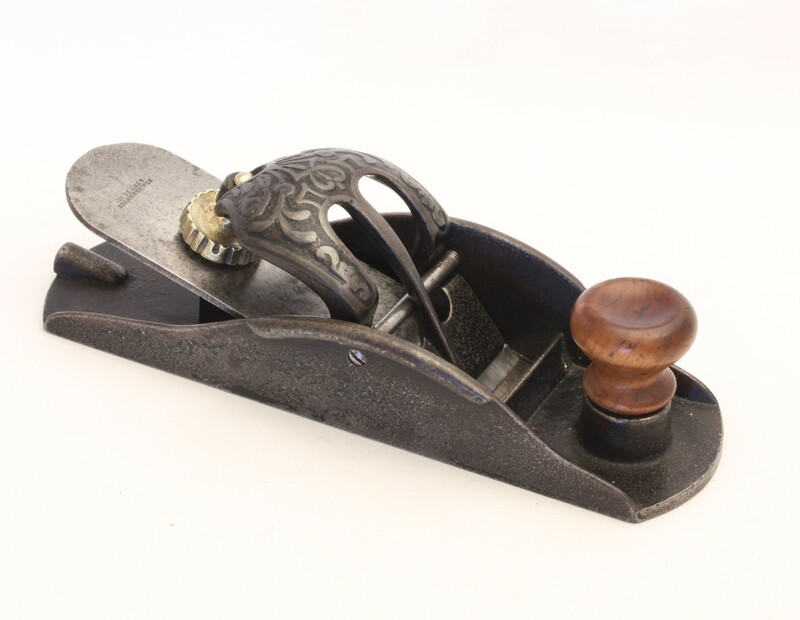 Bailey it appears, like Traut, looked at the Holly block plane in the Stanley Model Shop and also copied many of the features of this plane for his new line of Victor non-adjustable block planes. Figure 7 shows a Victor “0” non-adjustable block plane. It is 7 and 1/16th inches long and 1 and 15/16ths inches wide at the mouth. The plane body is nicely boat shaped with the same raised nib at the tail as Traut’s version, but is a bit wider at both the toe and tail than the Traut or Holly planes. 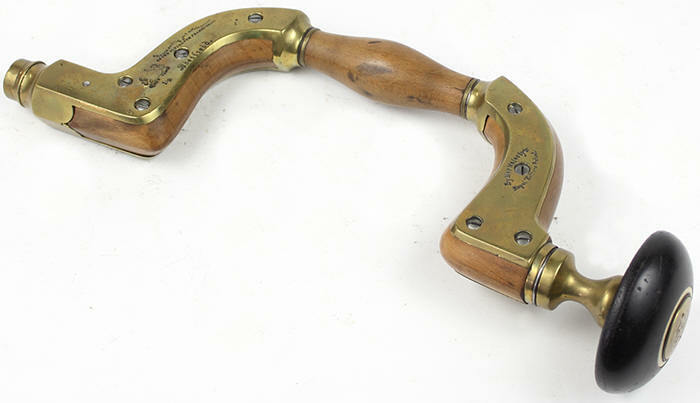 Bailey used a two-piece metal front knob, and substituted a slide in lever cap on these planes with a large lever cap adjustment screw at the top of the lever cap instead of the “shoe buckle” lever cap. The cutter has clipped corners and is unmarked. When lined up next to each other, the similarities between these three planes are very obvious (See Figure 8). Holly would have no doubt been aware of both of these planes when they came to market and we can only wonder what he thought about all of this. He had no patent on his block plane so he had no real legal means to object. 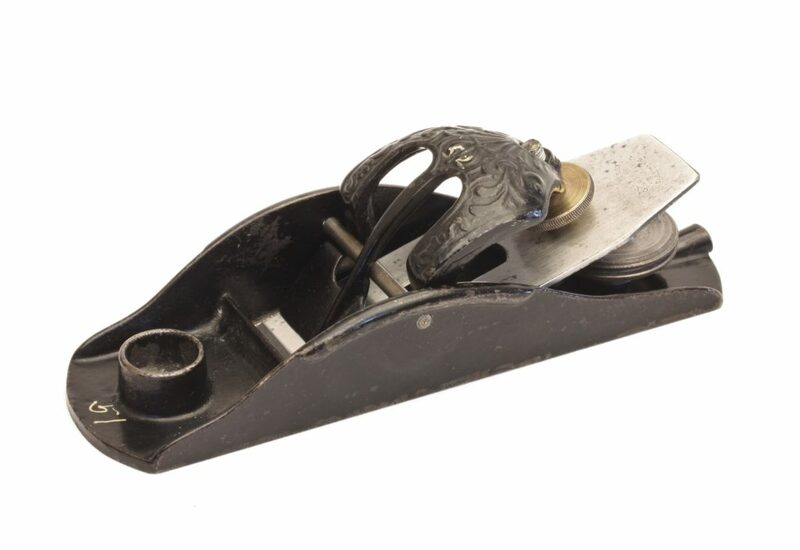 Little did he know that an unused version of his early block plane from the Stanley Model Shop would play such an important design role for these two inventors at a rather tumultuous time in the life of the Stanley Rule & Level Company. Figure 8. Leonard Bailey’s Victor “0” Non-Adjustable Block Plane on the left, Birdsill Holly’s Non-Adjustable Block Plane from the Stanley Model Shop in the Middle, and Justus Traut’s #110 Non-Adjustable Block Plane as Manufactured by Stanley on the Right. Birdsill Holly was born on November 8th, 1820 in Auburn, New York. His father died when he was only 10 years old and he was forced to drop out of school to help support his family. He became an apprentice in a cabinet shop and then apprenticed in a machine shop. By his late teens, he was a superintendent in a machine shop. He moved to Seneca Falls New York, in 1845 and became a partner in the Silsby, Race, and Holly Company which manufactured hydraulic machinery and steam powered fire engines. In 1851 he moved to Lockport, New York. The Holly Manufacturing Company was formed in 1859, so it may have been that Holly’s planes were made from 1851 until about 1859 in the years before the Holly Manufacturing Company was founded. His cast iron planes were a sideline business as his major focus was on cistern pumps, rotary pumps, fire hydrants and steam heating systems. He’s considered by many to be the inventor of the fire hydrant. He was granted over 150 patents in his lifetime. He was a personal friend of Thomas Edison and Edison asked him to become a research assistant at his Menlo Park laboratory but he declined, wishing to concentrate on his own business instead. He died on April 27, 1894. For more information on Holly’s cast iron planes see Roger K. Smith’s, Patented and Transitional Metallic Planes in America Vol. I, pp. 37-39 and Volume II, pp. 18-19. For further information on the Stanley #9 ½ block plane see John Wells & Jack Schoelhamer’s excellent type study titled “One Hundred Years of Bailey’s Excelsior Block Plane, The No. 9-1/2 Family”, in Antique & Collectible Stanley Tools, by John Walter, pp. 686-701. For more details on Bailey’s exit from Stanley and the beginnings of Leonard Bailey & Company see, “Leonard Bailey: The Years at Stanley Rule & Level Co., Part II” in The Gristmill, No. 136, September 2009, pp. 12-23, and “Leonard Bailey: In Hartford and Woonsocket, 1875-1884 Part I”, in The Gristmill, No 139, June 2010, pp. 10-22. Both articles are by John G. Wells and Paul Van Pernis. 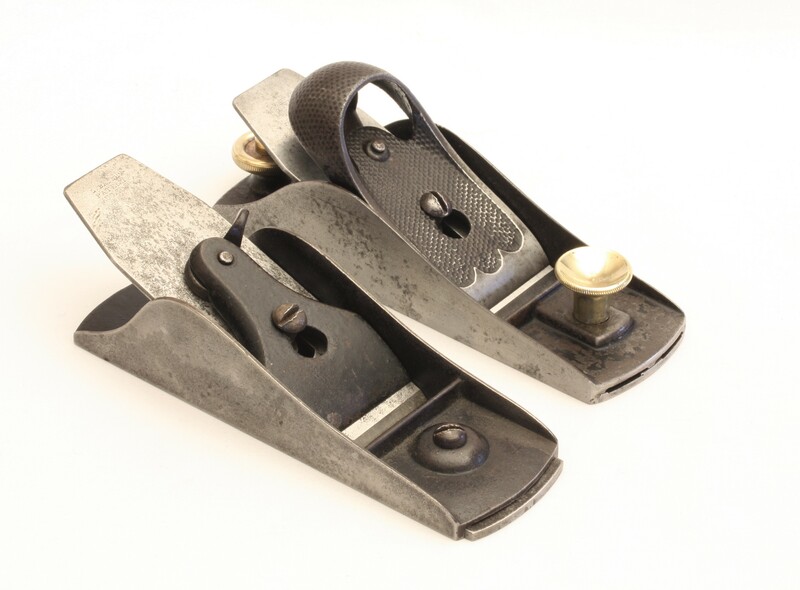 The non-adjustable Victor block planes were all the same size and were offered with two different finishes. The “0” has a japanned finish, the “00” has nickel plated trimmings. It is with a heavy heart that I write about the passing of Don Taylor a long time EAIA and MWTCA member and avid tool collector earlier this year. (Details below) His son Scott Taylor wrote to me that he wanted to let the group know that he’s working to settle his father’s affairs and in doing so will be selling his tool collection. Information on the collection and how to connect with Scott is included below. Don’s collection covered a LOT of Early American Industries (See some of the photos below) . If you are in the mid-atlantic area and/or can get to Winchester VA I highly encourage you to reach out to Scott and pick up some great tools. This is the collection of Don Taylor (EAIA, MWTCA member) who passed earlier this year. 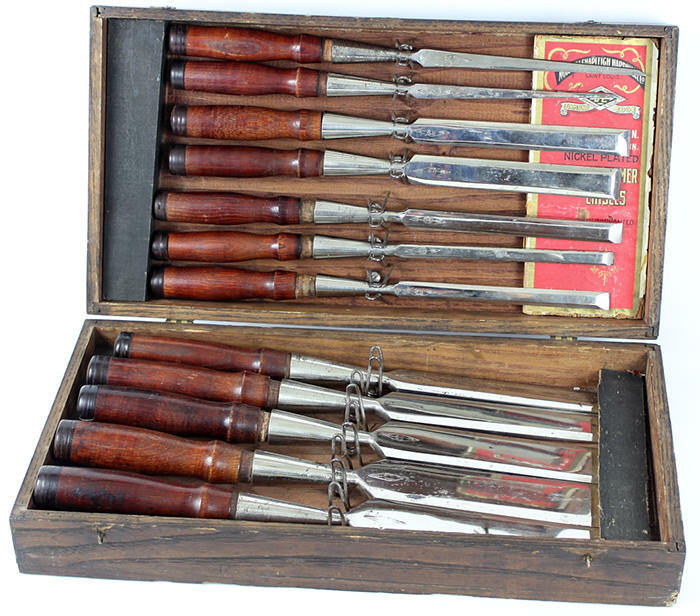 The collection consists of mostly early American tools, kitchen, glassware, measuring tools, blacksmithing, and a general assortment of other antique type tools and collectibles. Also, lots of great books on the history, making, collecting of many things. I would be interested in either hosting a small gathering of people to have a private shopping experience at the house in Clear Brook, or individually, both upon appointment. This is my full time job right now, so I am very interested in continuing to connect with interested buyers, either in lots or as individual items. Separately, there is a lot of door hardware and miscellaneous stuff that I feel would work well for certain artists, in case word of mouth travels beyond the traditional scope of EAIA. I would be interested in selling or donating to those interested artists. The house is located just outside the city limits of Winchester, VA and I can be reached by mobile at (202) 839-2114 or sctaylor19@icloud.com. Don Taylor, 83, of Clear Brook, Virginia, died Thursday, May 5, 2016 at his home. Mr. Taylor was born in 1932 in Cross Junction, Virginia, the son of the late Ethel Leone Luttrell and Arthur William “AW” Taylor. He was a graduate of Virginia Polytechnic Institute (Virginia Tech), where he received a Bachelor’s Degree and was a cadet in the Reserve Officer Training Corps in preparation for military service. 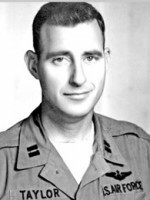 Mr. Taylor was a veteran, having served in the United States Air Force as a pilot during the Vietnam War, achieving the distinguished rank of Lieutenant Colonel. He retired from military service on December 31, 1978. After retirement he co-founded Liberty Realty in Winchester where he was actively involved in the community as a real estate broker/agent. 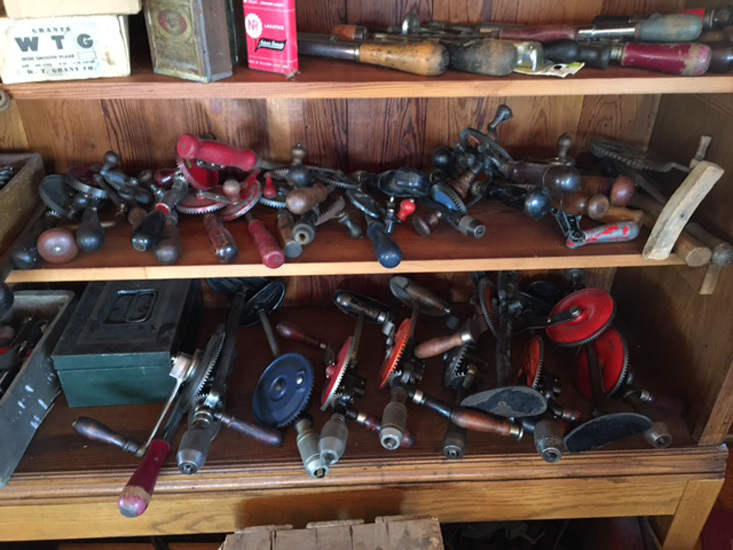 Mr. Taylor was an avid collector of tools and antiques. 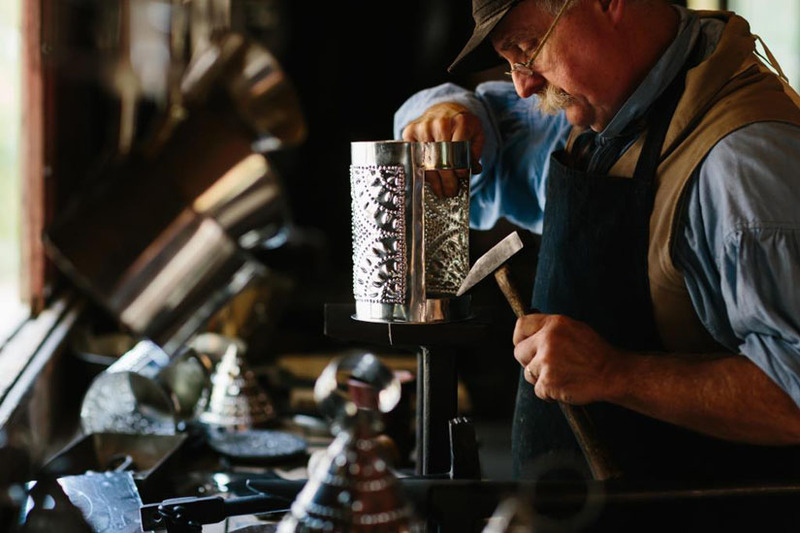 He was fascinated by and well versed in the history and craftsmanship of things, particularly American tools and art. He also enjoyed reading about the Civil War and could always be found enjoying a good book. Mr. Taylor loved being outside in his yard enjoying his landscaping and gardening. Surviving are his sons, C. Scott Taylor, D. Michael Taylor, and Don Taylor and his wife, Laura; grandchildren, Susan Taylor, Nan Taylor, Travis Taylor; great grandchildren, Cade, Brooklyn, Chassy, Chandler and Trey Taylor; sister, Ellen Patton; brothers, John C. Taylor, Arthur “Skeeter” Taylor, and James “Dink” Taylor; many loving nieces, nephews, cousins and friends, including his former wife, Brooke Taylor and dear friend Smahan Upson. Two brothers, Kenneth Taylor and Charles “Soak” Taylor, preceded him in death. The family will receive friends prior to the service on Thursday, May 26, 2016, from 10:00 – 11:00 AM at Omps Funeral Home, South Chapel. A funeral service will then be conducted at 11:00 AM on Thursday, May 26, 2016, at Omps Funeral Home, South Chapel. Interment will be in Shenandoah Memorial Park, Frederick County, Virginia. In lieu of flowers, memorial contributions may be made in memory of Don to Blue Ridge Hospice, 333 West Cork Street, Suite 405, Winchester, Virginia, 22601. They operate as a non-profit and treated him with dignity and respect while helping him through his final days. Please view obituaries and a tribute wall at www.ompsfuneralhome.com. Prices realized in this article include a 13% buyer’s premium. A 3% discount is available for cash or a good check. Prices enclosed in square brackets are pre-auction estimates taken from the Brown auction catalog No. 49. The condition of all items was taken from the same auction catalog and neither the pre-auction estimates nor the condition of items reflect the author’s opinion unless so noted. All photographs are courtesy of Brown Auction Services. Lot 82. The William Marple’s Ultimatum brace was made very special by being filled with Beech in lieu of the much more often used Ebony and by having an extra long nozzle. It has one chip in the edge of the Ebony head which was balanced by its original complete ivory ring. It had not been buffed or polished, and was rated Good+ for condition. It was valued at [400-800] and sold for $248.60. Lot 86. The William Marple’s Ultimatum brace rarely seen with a Boxwood infill which increased its value over those with the more common Ebony infill, even though there was a crack in the front infill which had been repaired in 1983. It was rated Good for condition, and was valued at [750-1500]. The opening bid was $100 and it sold for $310.75. Lot 121. The St, Johnsbury Tool Co., rare double bevel which can also be used as a try square was made under patent No. 125,617, dated April 9, 1872. It has an iron body with two 9 inch steel blades making it more durable although less attractive than the similar version that has a brass body. It is faintly marked with the patent date, was rated Good+ for condition and valued at [1000-1500]. It opened and was sold for $1325. The final price with the buyer’s premium was $1497.25. Lot 174. This Stanley No. 444 Dovetail plane is in its original, cardboard box with a sweetheart label. This lot includes the fence, the original instruction booklet, a sample wooden dovetail, four original cutters in a wooden box, the original two spur blocks and a small screw driver. The cardboard box has a good label but its lid has four split seams that have been taped together. and it is in only poor to fair condition. The tool is complete; the nickel plating is nearly complete and it was rated near Fine for condition. It is valued at [500-800]. It opened at $350 and sold for $649.75. 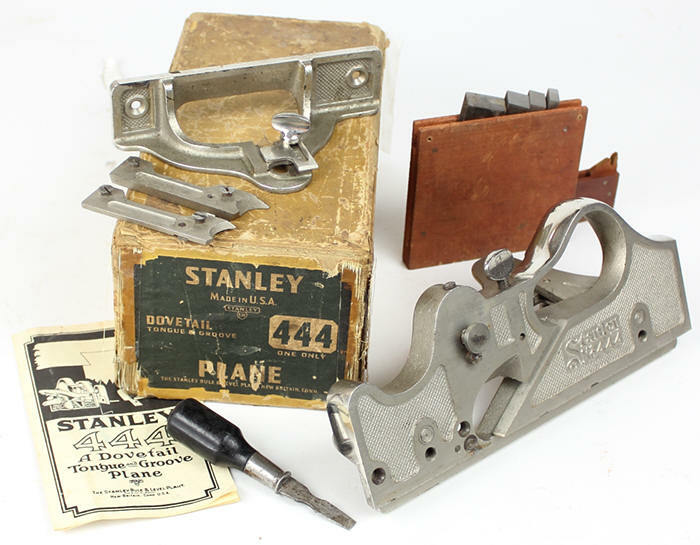 Lot 176 The Stanley A45, Type 14 aluminum combination plane, made in 1922 and having a second sweetheart trademark on the skate included a full set of cutters in two labeled wooden boxes, both rods, the cam rest, screwdriver, and the original instruction booklet. It was packed in its original cardboard box in only poor to fair condition with most of a good label, noting some split seams in the lid that have been taped. See David E. Heckel: The Stanley “Forty-Five” Combination Plane. The A45’s are rarely found in Fine condition like this one. It was valued at [600-1,200]. It opened at $800 and sold for $1,921. Lot 186. 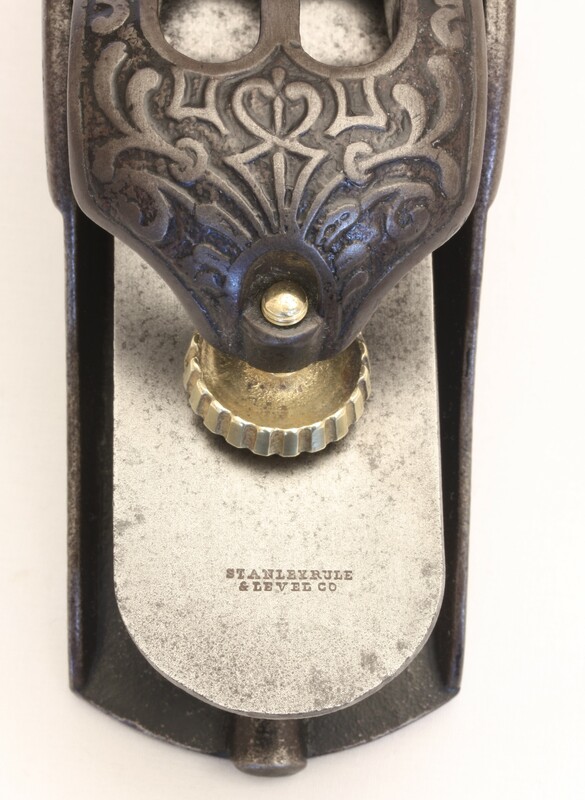 The Stanley No.72½ Chamfer plane with the beading attachment—the bull nose attachment was not added until 1909— had 90% of its original japanning on the planes body and 80% on the beading attachment. Only one of the beading cutter from a full set of six cutters with molding profiles cut on both ends was included in this lot. It was rated Good+ for condition, was valued at [400-600]. It opened at $250 and sold for $508.50. Lot 187. 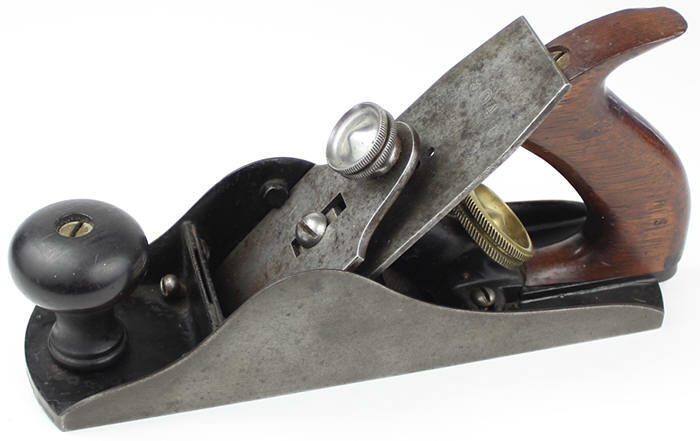 The Gage Tool Co. block plane is exceptionally rare, and sought after. See Roger K, Smith’s Patented Transitional and Metallic Planes in America Volume I, pp 117-123, figures 130a-139b. 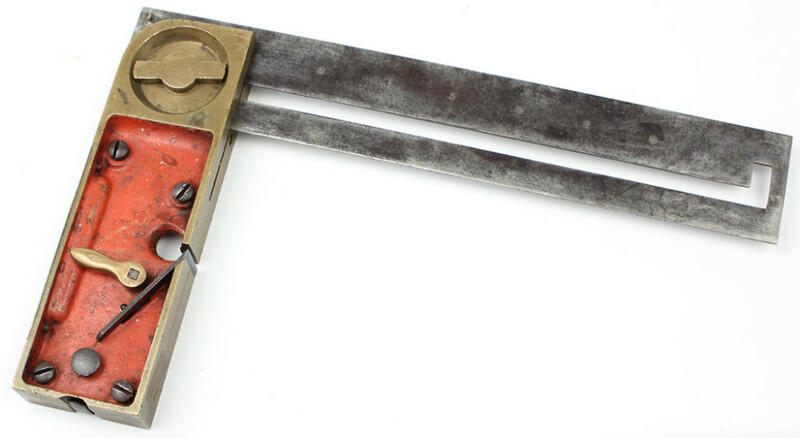 Only three or four of the earliest examples made by Bridges, Gage & Co. are known to exist and they were not japanned. Three of them were displayed by Ron Cushman at a Mid West Tool Collectors national meeting at Camp Hill, PA, on June 5, 2010. As stated by Roger Smith in Patented and Transitional Metallic Planes in America, Volume I on page 123, in April of 1917, Gage sold the Gage Tool Co. to Philip J. Leavens who then sold it to the Stanley Rule & Level Co. in 1919. Stanley continued making Gage planes until 1941. A few of the earliest un-japanned original examples have been sold at Brown’s auctions numbers 19, 21 and 35 for $3,630 to $4,356. This important which is shown in Roger K. Smith’s PTAMPIA, Volume I on page 122, Fig. 137 has been japanned and has a wood front knob that has split and then wired together. 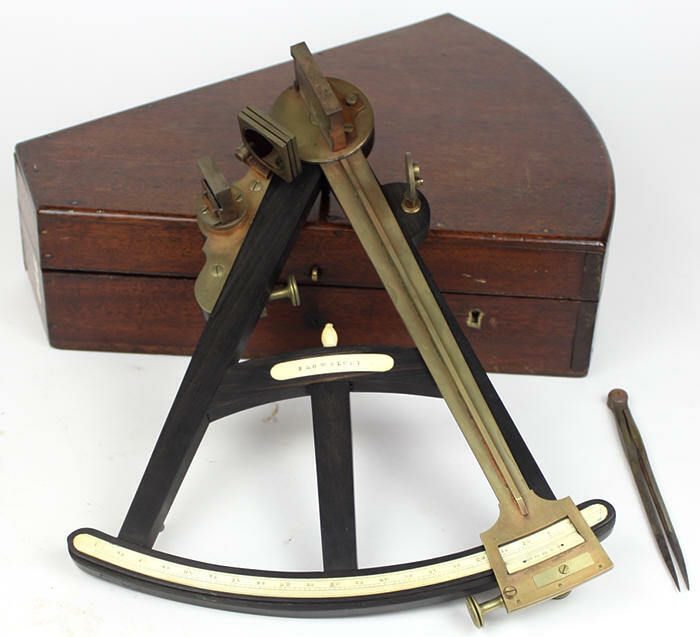 It is very difficult to estimate the real value of an early Bridges, Gage and Co. or Gage Tool Company of Vineland, NJ plane which could have been made between 1880 to 1919 when Leavens sold the company to Stanley. The plane was valued at [300-600] which was significantly lower than the prices noted above. It opened on a bid of $450 and sold for $904. Lot 188. This rare Stanley No. 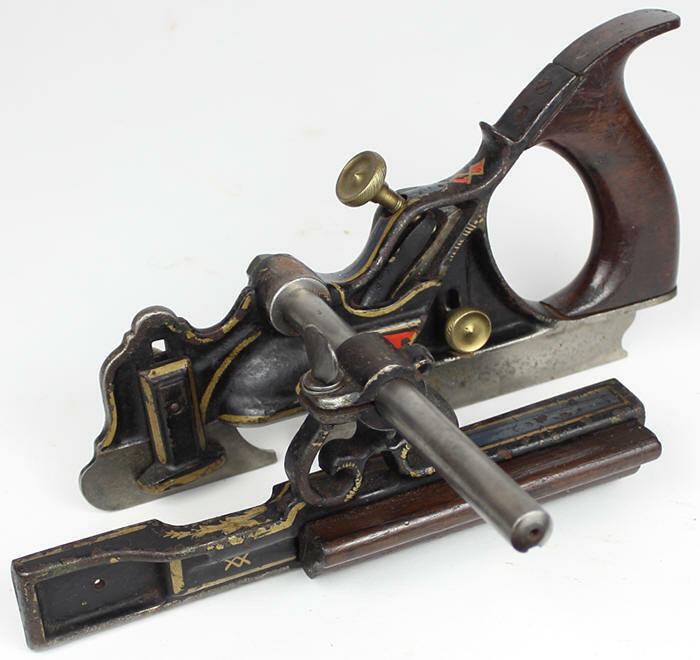 11 bull nose rabbet plane with the Liberty Bell adjustment was made in the United States but was first and only offered for sale in London, in the Charles Churchill catalogue of American Tools; it was never offered in a US catalogue. It was featured in “Every Man His Own Mechanic” an 816 page illustrated volume for the amateur artisan published by Ward, Lock & Co., in London. The No.11 appealed to the UK home craft market and like the Stanley No.101-1/2 it is more often found in the UK than in the US. Three different upper body castings have been identified, suggesting there were three or more small production runs. An exploded isometric of the No. 11 is shown in Roger Smith’s Patented and Transitional Metallic Planes in America, Vol.II, p.215, fig. 335a. Sale prices and values have ranged from $2,000 to $6,000. This example in Good conditions opened at $50 and sold for a surprising $1,243. Lot196. 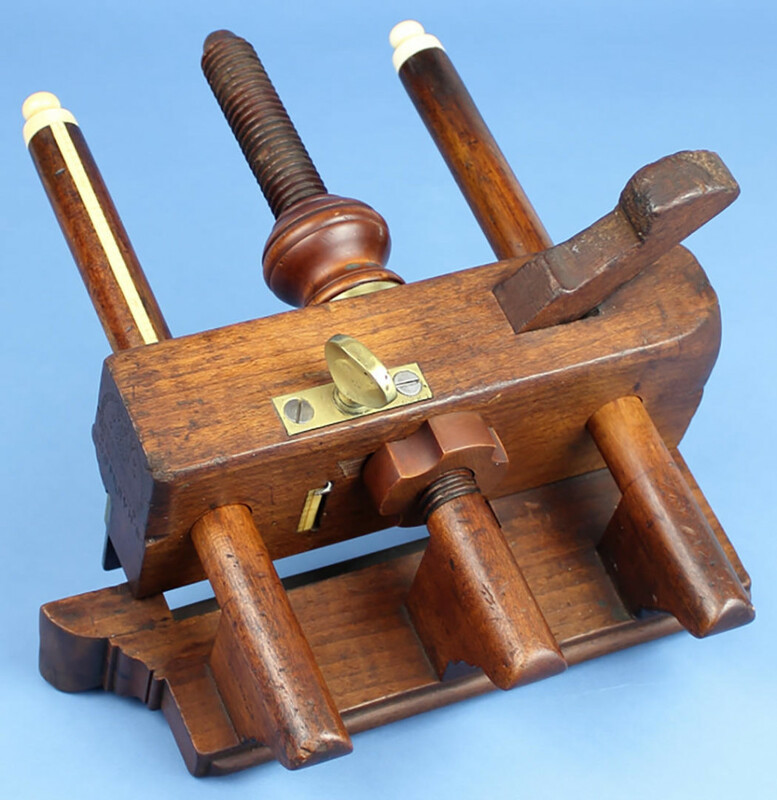 The Foss patent 1¾ x 8½ inch smooth plane lacks its adjustment mechanism, but has a rosewood tote and a rosewood knob. Foss offered block planes at a lower price with Beech totes and knobs and without the adjustment mechanism (Smith, PTAMPIA I, p. 700). The Rosewood tote and knob on this plane is an anomaly. The tote has been skillfully re-glued. It was valued at [300-600] and opened on a bid of $75 and sold for $237.50. Lot 237. The F. Nicholson “Living in Wrentham”, molding plane has Dutch decoration partly covered by the fence. It was valued at [1500-2500], was rated Good+ for condition. It opened at $200 and sold on a bid of $678.00. Lot 295. 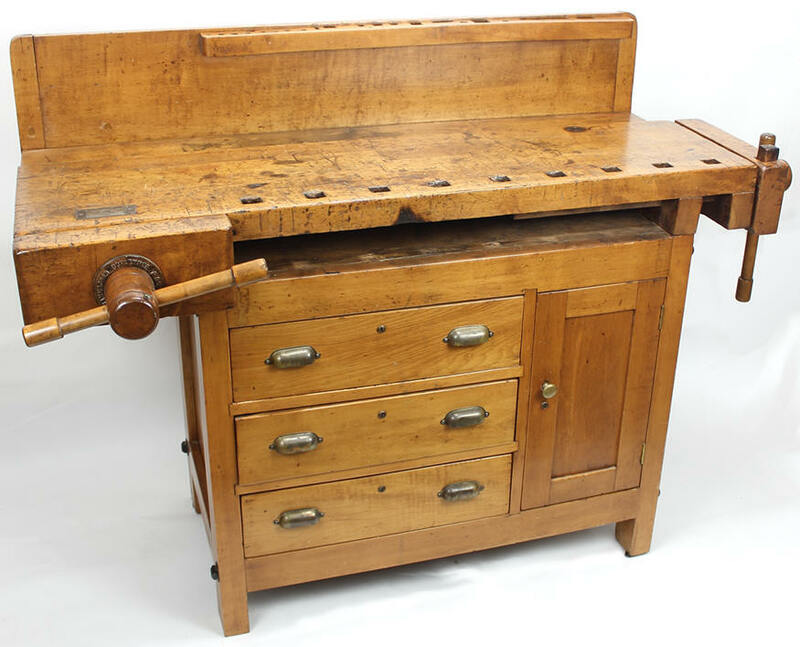 The Hammacher Schlemmer workbench made of Cherry wood, 48 x 19 inches x 40 inches high, has two working vices and was made for an amateur’s living room. It’s a really nice little bench and is rated Fine for condition. It is valued at [600-1200] and opened at a bid of $900 and sold for $1130. Lot 298. The Trump Brothers, Wilmington DE, Fleetwood No. 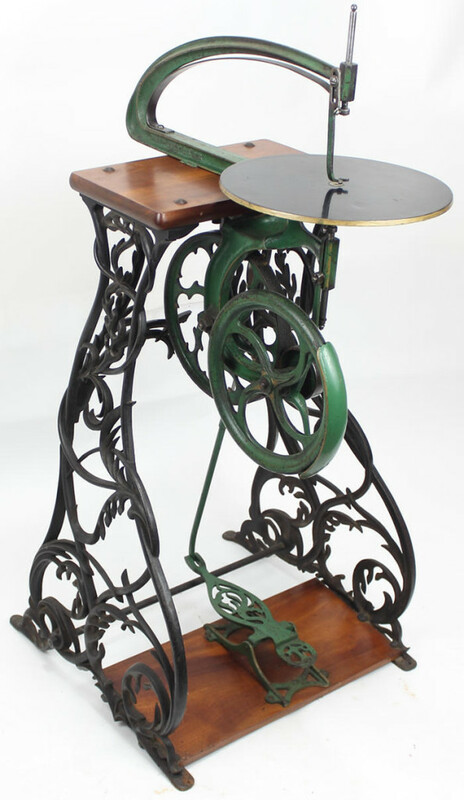 2, foot pedal operated Jig Saw, patented July 23, 1872, is mounted on the original 40 inch high cast iron stand finished in blackish green with gold highlights. It was rated Fine for condition, was valued at [600-1000], and opened at a bid of $200 and sold for $678. Lot 299. Roger’s Miter Planer, patent No. 264,766, September 19, 1882, with two 4 inch wide cutting irons, was manufactured by the Millers Falls Co. See the A. J. Wilkinson & Co. Boston Catalogue, ca. 1888, Roger Smith: P-TAMPIA vol. I, p.151 fig 181; and Plate 25 and Wm P Walter’s & Sons catalogue No. 11, ca 1900, page 62,. This example is lacking the two adjustable guides or fences—which would be almost impossible to find but serviceable fences could be made. It was otherwise rated Good for condition, was valued at [1000-1600] and sold for $480.25 after an opening bid of $400. Lot 316. This is the very rare Carroll Thomas patent No, 252,065, January 10, 1882, Lincoln Il, combination bevel, try square, marking gauge, rabbet plane and level mounted in the main stock of a cabinet makers square as shown in Roger Smith’s P-TAMPIA I on page 210, Plate 29b. It has one small screw missing from the level vial cover, but otherwise the finish is in better condition than the example pictured. It was rated only Good for condition, was valued at [900-1600]. It opened at $225 and sold for $621.50. Lot 317. The Ebony octant in a Mahogany case made by E. & G. W. Blunt, working in New York from 1826 through 1866, has three filters, and an ivory scale with veneer graduations for correctly reading important dimensions and was rated Fine for condition. It was valued at [750-1500]. It opened at $1,125 and sold for $1,125 resulting in a total cost to the buyer of $1,271.25. Lot 372. The Stanley No. 10¼ C Rabbet Plane has a corrugated sole and lateral adjustment but does not have a tilting handle or knob, is the rarest of the very rare. (See Schade’s Patent No. 707,054, date April 11, 1905 for the tilting handle and front knob. Also see John Walter, Stanley Tools, pp. 363-365). The cutter has 1907 and 1909 trade marks indicating that the plane was probably manufactured between 1912 and 1917. The japanning is about 70%, and there are a few scratches on the cheeks; it was rated Good for overall condition. The value reported in 1996 by John Walter, in Stanley Tools was $750-1500. The estimated value in this auction catalog was [400-800]. It opened at a bid of $875 and sold for $1073.50. Lot 408. The three arm un-handled plow plane by Israel White, with out the fence bridge which was added later, has a Beech body, arms and fence, Rosewood boxing and Boxwood nuts. It is one of the very rare six examples that were made by White himself, rather than by a shop journeyman. It has an ivory tip on each of its two arms, an ivory scale along the front arm, and an ivory scale on the depth gauge. It has a few minor chips on the threaded arm and is really a super nice plane in Fine condition. It was s valued at [5,000-10,000] and it sold for $$7006.00 after an opening bid of $3000. Lot 417. The L. L. Davis 23 inch jointer is of the type patented by Charles E. Torrance, patent No. 122,339, January 2, 1872, and shown in Leonard Davis’ patent No. 167,311, dated Aug. 31, 1845. 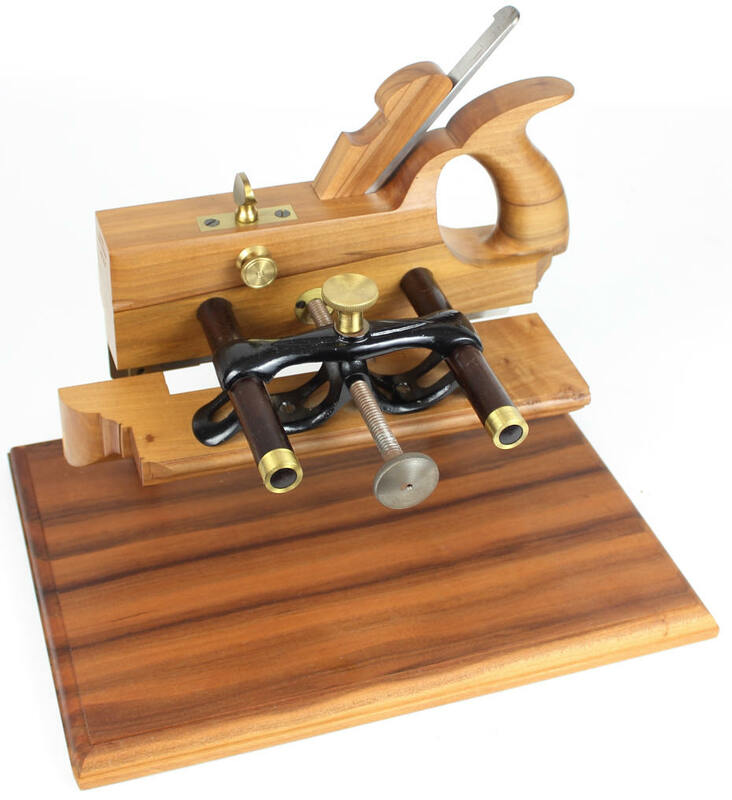 It has a Buck Bros cutting iron, a lateral adjustment mechanism, a Rosewood handle and knob, and is shown in Roger Smith’s P-TAMPIA I, p.182 fig. 222, and Plate 27a on p. 179 and in Andrew D’Elia’s, American Wood and Metal Planes, pp, 196-200. It was valued at [2000-4000], was rated Fine for condition and it sold after an opening bid of $550 for $904. Lot 425. 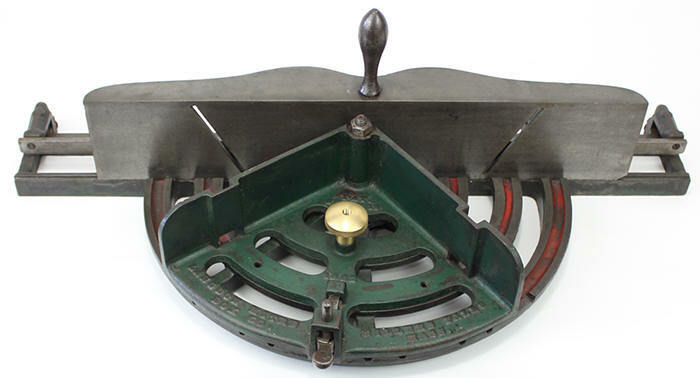 The Phillips patent plow plane, with Mayo’s improvements, made by the Boston Tool Co. and shown in Roger K. Smith’s P-TAMPIA I pp. 85-90, and figure 95 on page 88 has a full length Rosewood runner on the skate. 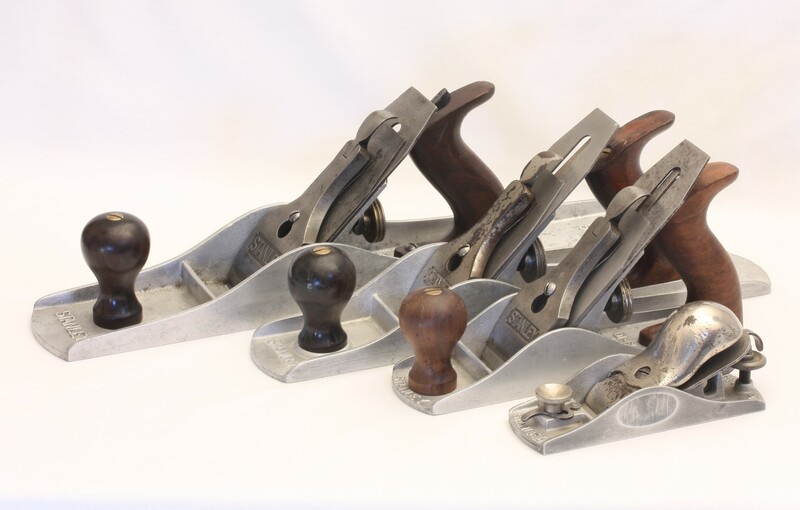 Also see Andrew D’Elia’s, American Wood and Metal Planes, pp, 316-318 and Lot 580 in this auction. This example has most of the pin striping and good wood and was rated Fine for condition. It was valued at [400-800]. It opened at $800 and sold for $1045.25. Lot 426, The Union No. 44, 3/8 inch beading plane, is very rare. It was in Good+ condition, noting the loss of nickel plating on the lever cap, and was valued at [250-500]. See Roger Smith P-TAMPIA I, page 259, figures 329- 330. It opened on a bid of $450 and sold for $450 leaving the buyer a total price of $508.50. Lot 427. 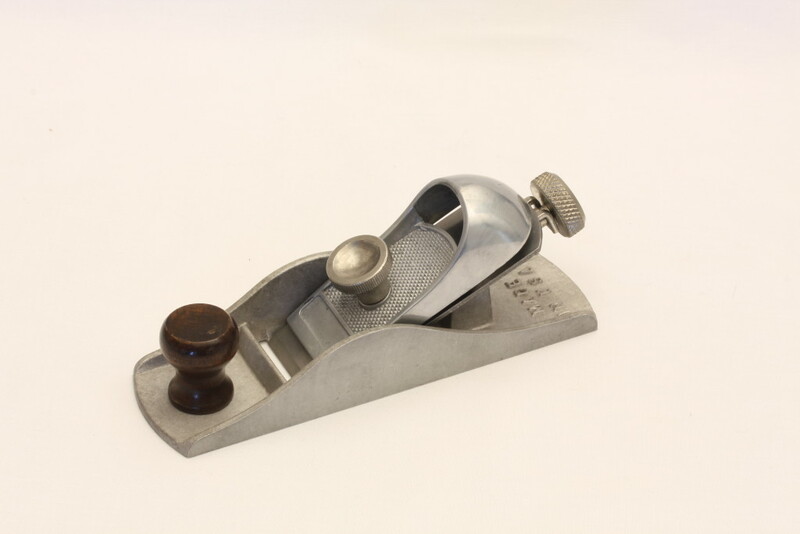 The S. C. Tatum & Co. rabbet plane was patented by three workers: John M. Bennett patent No. 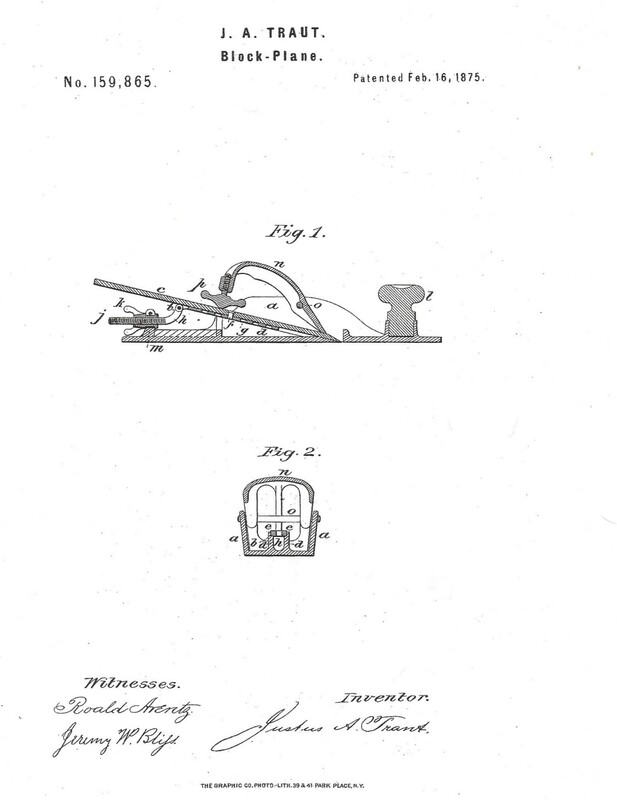 284,941 granted Sept, 11, 1883; Samuel E. Hilles patent No. 299,927 granted June 3, 1984 and John A. Keiser patent No. 305,602 granted Sept 23, 1884. See Roger Smith: P-TAMPIA I , p.143, fig. 173. The plane is very rare, was in Good+ condition, and was valued at [800-1600]. It opened at a bid of $225 and sold for $395.50. Lot 428. The William Steer’s No, 304, adjustable smooth plane, has Rosewood strips let into “T” shaped grooves in the sole intended to reduce friction. It is very unusual to find these with the Rosewood inserts in excellent condition and this example just didn’t quite make it. It was rated Good+ for condition, was valued at [500-1000] and sold for $1017.00 after an opening bid of $650.. Lot 429. 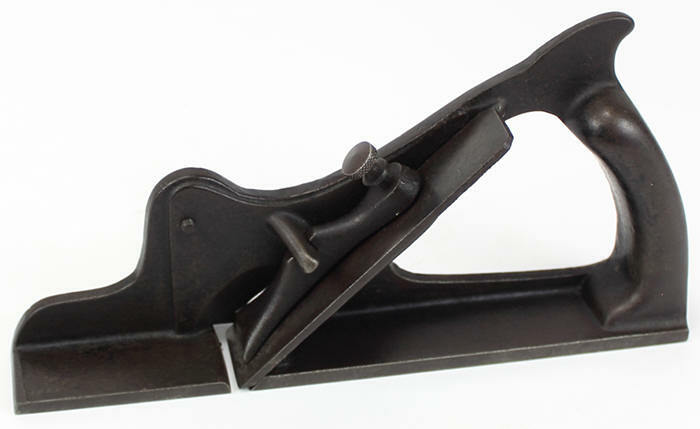 The earliest patented cast iron plane, Type 1, was patented by Hazard Knowles, patent No. 4859X, granted August 24, 1827, and was sold in Brown’s 44th auction. This example is a Type 2, 7-1/2 inch smooth plane, probably cast by Savage, ca. 1845, having an upstanding knob on each end but not having a cusp on the top edge of the sideboard above the mouth and is therefore not Type 1. Type 1 would have had an upstanding cusp in the sideboard just above the mouth; these are extremely rare with only two or three examples are known to exist but this Type 2 is still very scarce.. It has a Butcher iron, was rated Fine for condition, was valued at [8,000-12,000]. It opened on a bid of $2000 and sold for $4068. Lot 430. The Challenge 9 inch smooth plane was patented by Arthur Goldsborough, and was made by Tower and Lyon in the smooth and jack sizes only. See Roger K Smith, P-TAMPIA I, p166, figures 201 and 202. This example has a crack in the tote, some of the black paint has worn off, and otherwise it was rated Good for condition. It was valued at [1,000-2,000] and sold on a bid of $1,582.00 after an opening bid of $900. Lot 467. The Stewart Spiers 18 inch dovetailed fore plane with a 2-5/8 wide cutter, has a beautiful Rosewood infill. It was rated Fine for condition, was valued at [800-1500]. It opened at $400 and sold on a bid of $706.25. Lot 469. This 10½ inch dovetailed steel miter plane is rusty and corroded overall. It has a 2¼ inch Ward & Payne iron which is rusty and worn down by use. It has a dark Rosewood infill, a super tight mouth. It was rated Good for condition, was valued at [400-800] and opened on a bid of $850 and sold for that same amount leaving the buyer with a total cost of $960.50. Lot 549, This beautiful boxed set of twelve Norvell-Shapleigh Hardware Co. No. 12N 10B nickel-plated bevel-edge firmer chisels, 2 to 1/8 inches wide and 14 inches long were rated Fine. They were valued at [125-200]. They opened at $350 and sold for $734.50. 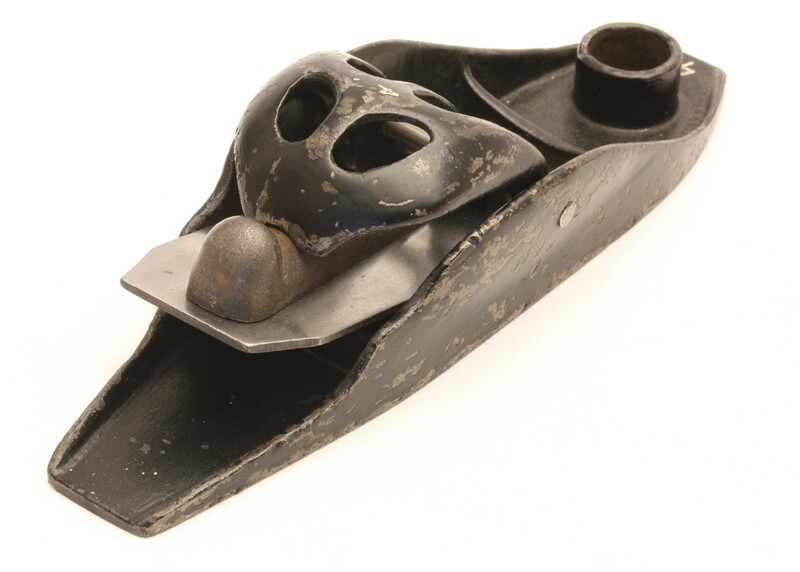 Lot 580, This is a Phillips improved plow plane with a stronger and stiffer body than the Phillips plow plane in Lot 425. See Andrew D’Elia’s, American Wood & Metal Planes, pp, 316-318 and Roger K. Smith P-TAMPIA I plate 17, page 87, noting the plane with the Babson & Repplier No. 7 Doane St. oval stamp on the skate, and the M. C. Mayo’s –Improved – Jan. 1, 1872 stamp on the fence. It is finished with black japanning and high lighted with gold and red pin striping. It was one of the most attractive iron plow planes in this auction. It was rated Fine for condition, was valued at [400-800]. It opened at $750 and sold for that same amount leaving the buyer with a total cost of $847.50. Lot 582. The third model of the nickel-plated Edwin Walker adjustable profile plow plane has eight adjustable plates used to create molded surfaces. It has a minor loss of nickel plating, a single miss matched replacement web screw and only one of the original cutters. 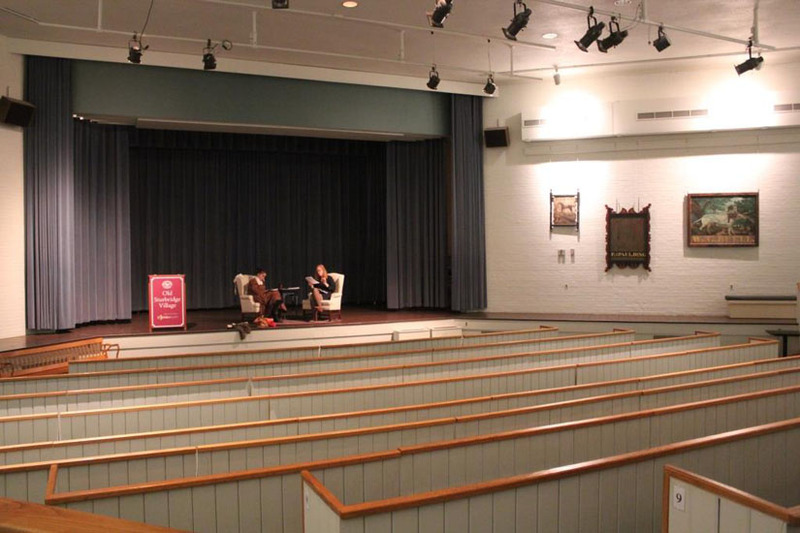 It was rated Good for condition, and was valued at [550-1,000] It opened on a bid of $250 and sold for $508.50. Lot 588. 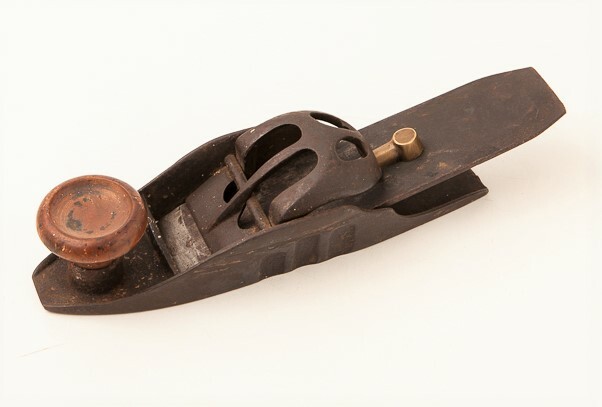 The beautiful solid Rosewood Mockridge & Francis self-regulating three arm plow plane was made by the Newark N. J. partnership of Mockridge & Francis. 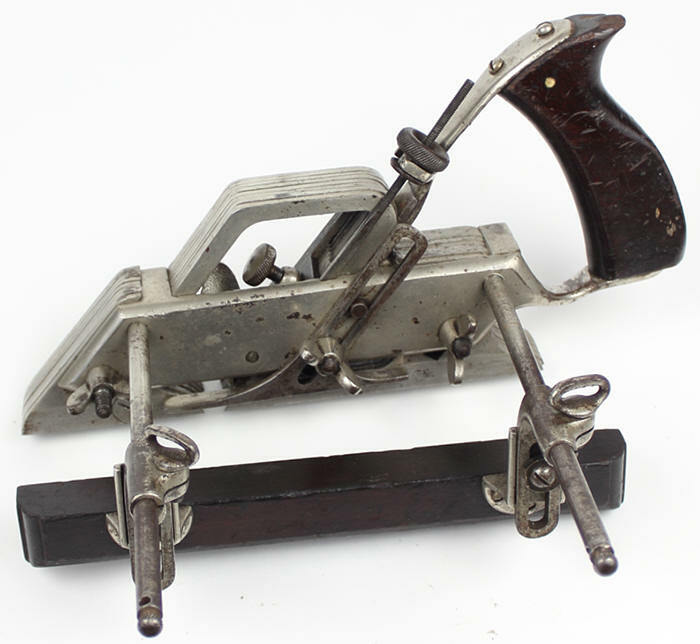 Its arms and the center adjuster are trimmed in brass as shown in Rosebrook and Fisher, Wooden Plow Planes, p. 206. It is in superb condition, noting that it has only one cutter. It is undoubtedly one of the finest wooden plow plane ever made, and was certainly the best one in this show. It was valued at [6,000-12,000]. It opened at $3,000 and sold for $6,780. Lot 593. This is number three of a batch of ten re-productions of H. Chapin’s No. 239¼ self-adjusting bridle plow planes made by America’s most accomplished finest plane craftsman, the late Robert Baker. They have Apple wood bodies, boxed Lignum Vita arms and cast iron adjustment mechanisms. This one sits on a nice laminated wood display stand which like everything that Bob has made is first class. It is Mint, was valued at [1,500-2,500]. It opened at $400 and sold for $1,130. 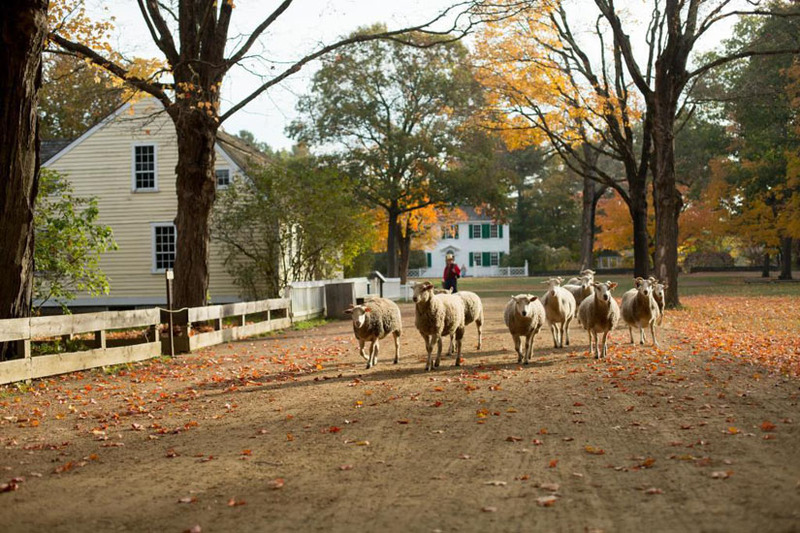 Plans are coming together for the 2017 Annual meeting at Old Sturbridge Village, an organization and venue that has had a relationship with EAIA as far back as 1946, the date that the Village was founded and opened for business. 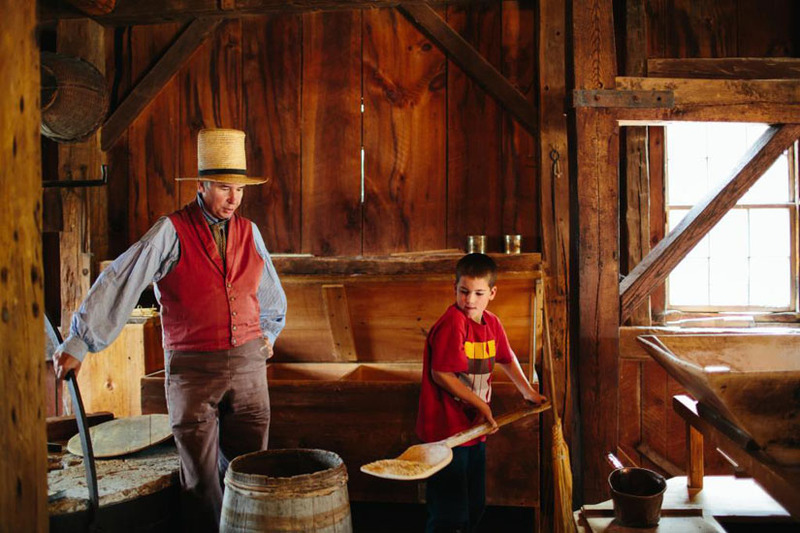 The Village interprets life in a rural New England village during approximately 1790 through 1840, a period of great economic, social and industrial change. 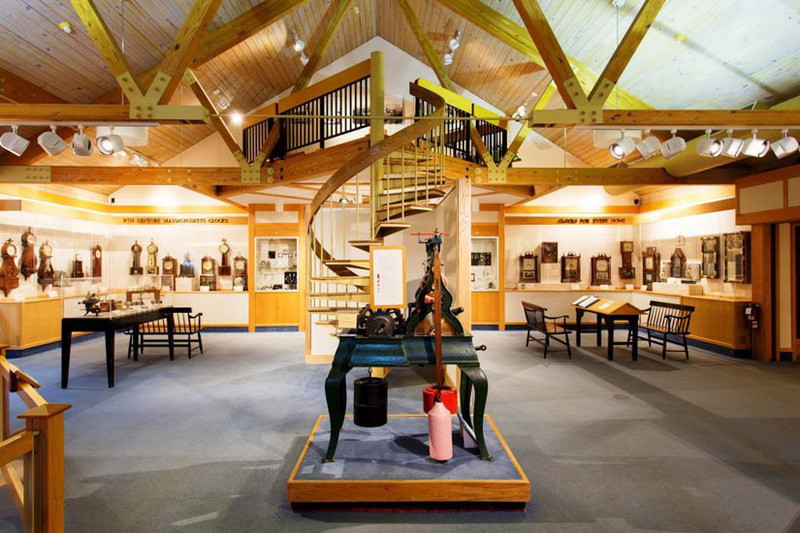 It includes more than 40 original buildings, including homes, meetinghouses, a district school, country store, bank, working farm, three water-powered mills, and trade shops – all situated on more than 200 scenic acres. In addition, the Village has a collection of more than 50 thousand items and an extensive library of early works. Old Sturbridge Village serves as an ideal location for the Annual meeting, providing all of the resources in one location necessary to address the interests of every EAIA member, from those interested in its extensive collections to those interested in seeing how things were done in the period represented….and perhaps of more interest….how to do them. Old Sturbridge Village not only has very knowledgeable interpreters and a very extensive collection and library, but it is well known for its educational philosophy, particularly a hands-on approach to learning by doing. The interpreted aspects of the Village revolve around life in a typical village of the period. 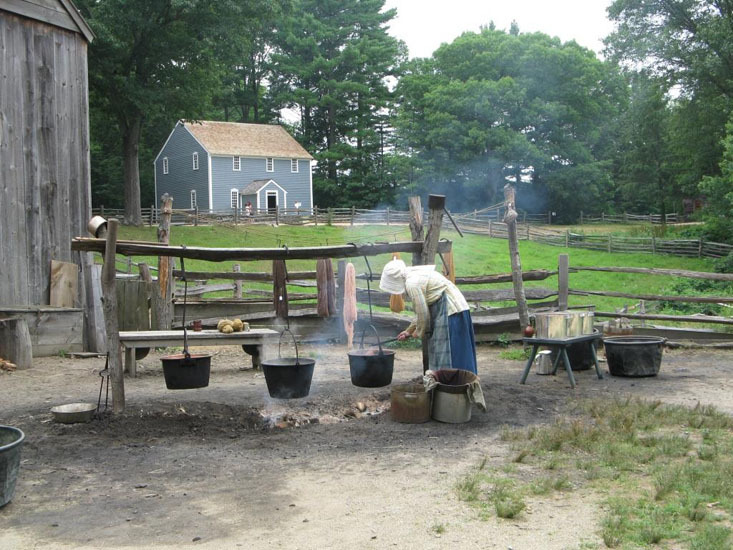 The historic homes are interpreted for activities that were typical for residences which range in size and sophistication from a very small family house (the Little House) to the simple but comfortable home of a blacksmith (Bixby House) and ultimately the sophisticated, large, and well-furnished home of a well-to-do farmer (Salem Towne House). 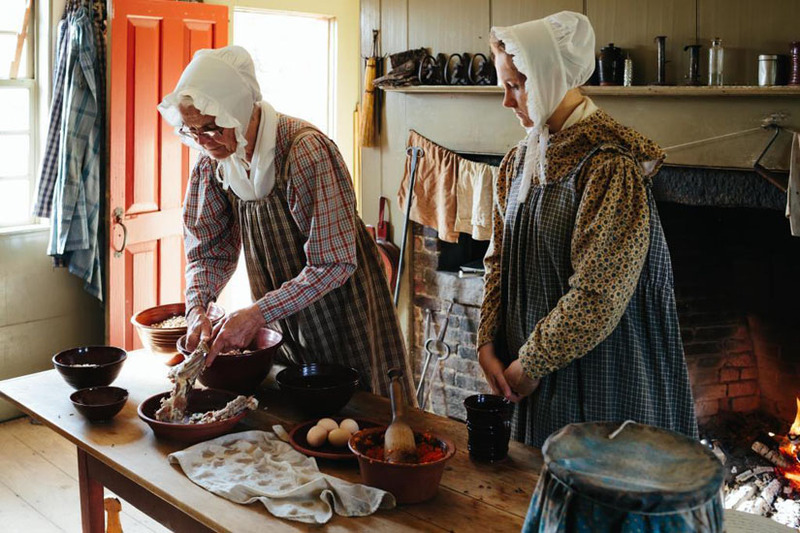 Kitchens are often in operation and domestic activities such as spinning and sewing are evident. 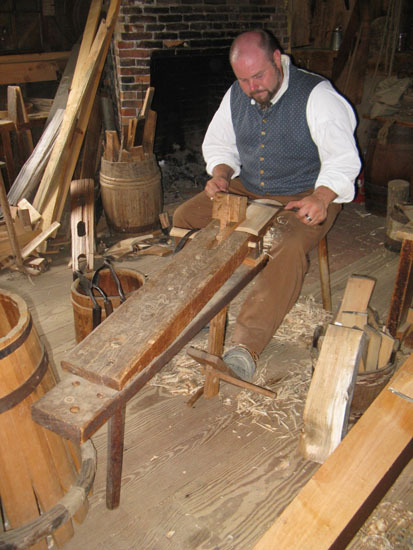 The typical crafts of the period are demonstrated at the appropriate venues, in the shoe shop, blacksmith shop, tinsmith shop, and cooper shop, all of which are relocated historic buildings. 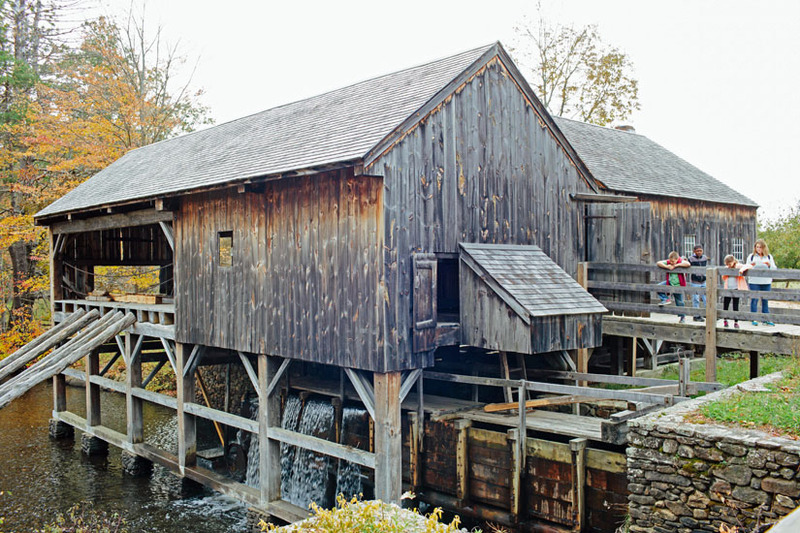 Of particular interest to those interested in early industrial processes of towns near rivers….and most were near rivers….are the mills of which the Village has three: a gristmill, carding mill and sawmill. All three are powered from the Village’s millpond on the Quinebaug River and are operating on a regular basis. Members of the Fiber Interest Group will enjoy the wide range of fiber arts interpreted at the Village. The fiber processes start where fiber starts: with sheep and plants, all part of the agricultural aspects of the village. The process continues with various fiber processes including dying, carding, spinning, weaving and ultimately design and sewing. 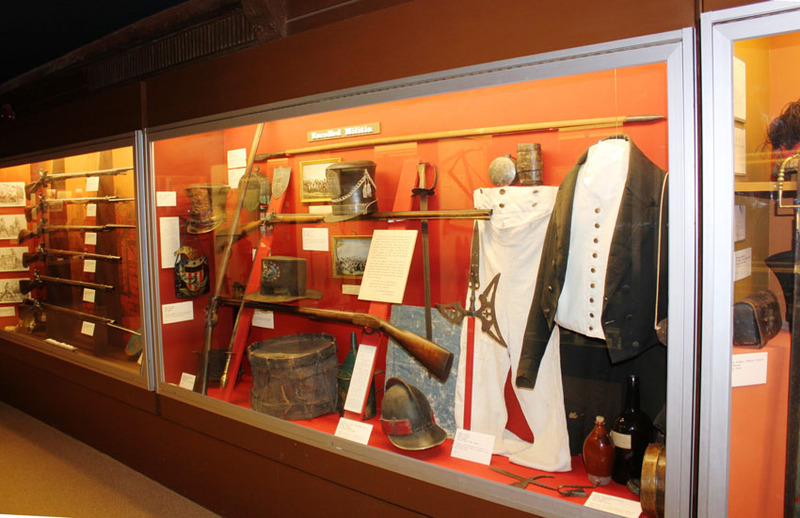 Members will also be interested in a number of static exhibits including guns of the period, lighting, glass and one of the country’s largest collection of clocks of the period. 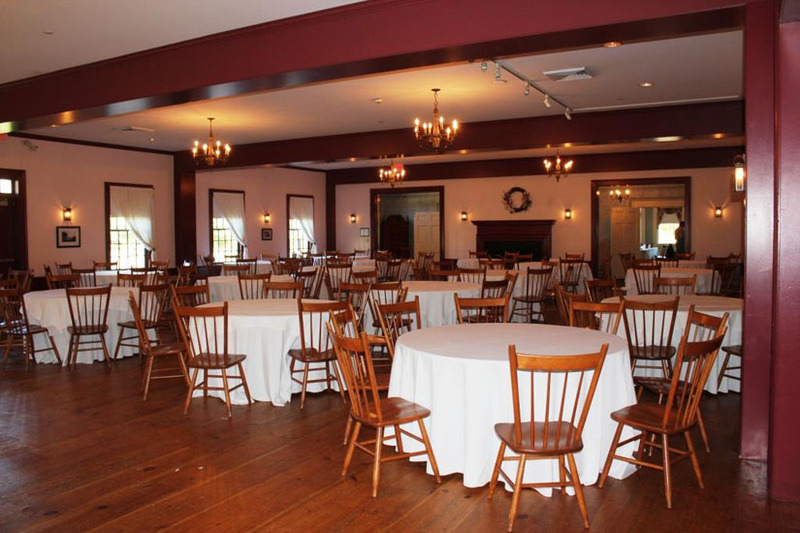 Several of the events of the Annual Meeting will be held in the onsite dining and convention facilities of the Village including the Stephen Brewer Theater and the rooms of the Oliver Wight Tavern. 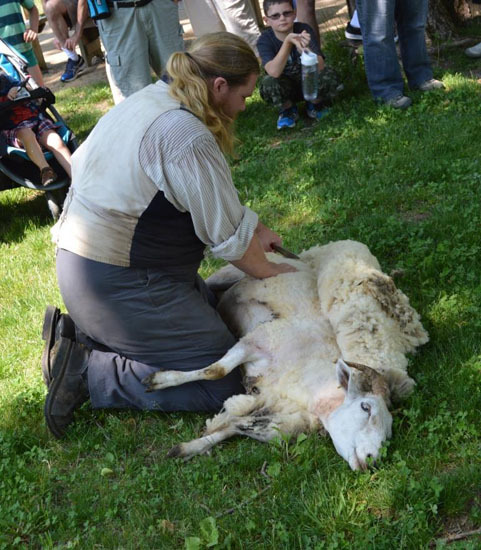 Perhaps one of the most attractive aspects of the Annual Meeting activities will be the hand-on activities for which the Village is very well known and emphasizes as part of engaging history. 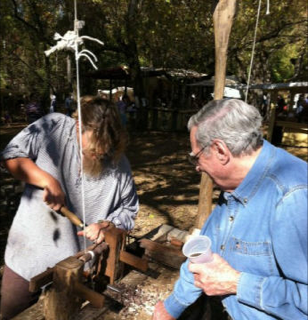 These will include actually doing blacksmithing and tinsmithing in the Villages educational facilities. For the Fiber Interest Group it will include planning and starting a fiber arts project while at the Village. 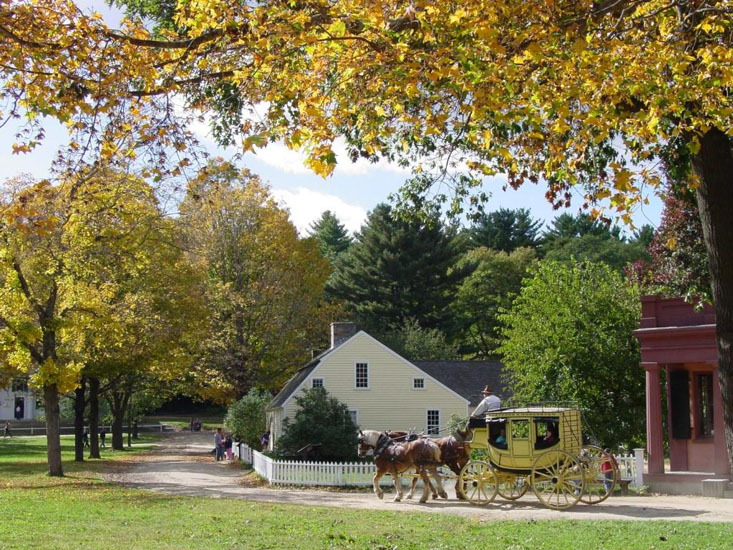 The planning for the 2017 Annual Meeting at Old Sturbridge Village is coming along well. Save the date (May 17-20, 2017) and look for information in the coming months about the detailed program and registration. In the first couple of decades of the 20th century, aluminum became available to manufacturers at a reasonable cost. Although aluminum comprises 8.2% of the earth’s crust, making it the most abundant metal in nature, it never occurs in its free form. In 1825, Hans Christian Oersted, a Danish chemist, was the first to produce small amounts of free aluminum. It remained extremely expensive to produce aluminum until Charles M. Hall, a young American chemist, and Paul Héroult, a French chemist, almost simultaneously invented a process in 1886 for obtaining aluminum oxide at a reasonable cost. German scientist Karl Joseph Bayer developed a process to obtain aluminum from bauxite a few years later, and the Hall and Bayer processes are used to this day to produce aluminum. Hall founded the Pittsburgh Reduction Company in 1888 which eventually became Alcoa (The Aluminum Company of America). Hall’s first products were tea kettles and pots and pans, but it didn’t take long for other manufacturers to appreciate the advantages of aluminum. Count Ferdinand Zeppelin used aluminum to make the frames for his Zeppelin airships. In 1903, the Wright brothers used a cast aluminum crankcase in their first airplane to save weight. This was the first time aluminum was used in the construction of an aircraft engine. By the First World War the Germans produced the first full metal aircraft, the Junkers J1 monoplane that was built primarily from aluminum. Despite these instruction from the Operating Committee, Stanley did not offer any aluminum planes for sale in their catalogs until 1925, when an expanded line of Stanley aluminum planes were offered for sale in the Stanley No.34 catalog. They included the A4, A5, and A6, bench planes, and the A18 block plane (See Fig. 1). The A78 duplex rabbet and filletster plane and the A45 combination plane were added to this line in the 1926 Stanley No. 34 catalog(See Fig. 2). 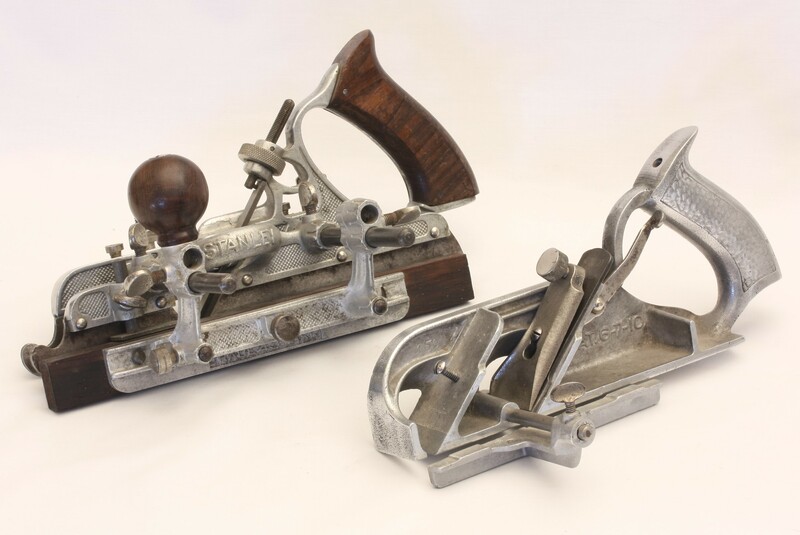 These planes were identical to the same Stanley planes offered in cast iron but the bodies, frogs, and fences were made of aluminum and no japanning was done on these planes. They were significantly lighter than their cast iron counterparts and were about 30 percent more expensive . Stanley didn’t aggressively market or advertise their line of aluminum planes. They were lighter weight, didn’t rust, and were not likely to crack or break like cast iron when dropped, all of which were good selling points. However, the aluminum planes when used, tended to discolor the wood, leaving black marks that were hard to remove. They also wore unevenly and the aluminum bodies were subject to scratches and dings if not handled carefully. Stanley also had the misfortune of introducing these planes just prior to the onset of the Great Depression and their extra cost didn’t help sales, so these aluminum bodied planes were removed from production in 1935. 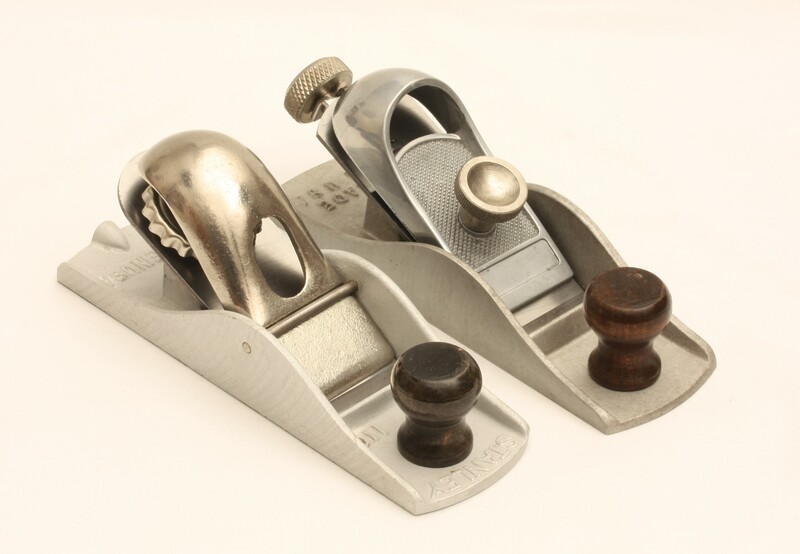 You’d think that Stanley had learned their lesson the first time, but here are two aluminum block planes from the Stanley Model Shop that prove they at least thought about trying it again (See Fig. 3). The first plane is identical to a Stanley #110 block plane, but instead of cast iron, the body of this plane is cast aluminum with prominent milling marks on the sidewalls. 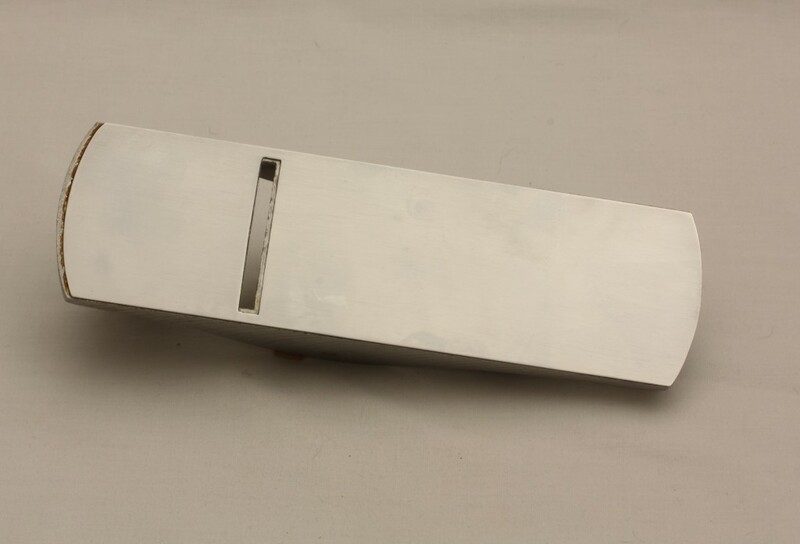 It is 7 and 1/8th inches long, 2 inches wide and has a 1 and 5/8ths inch cutter. 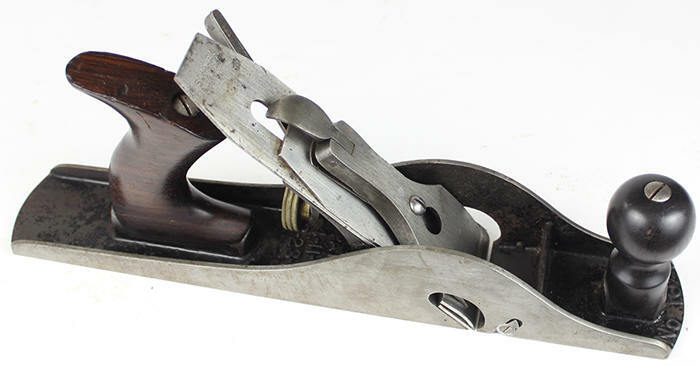 A 1/32nd of an inch-thick piece of polished rolled steel has been glued to the bottom of the plane, most likely to overcome the problem of black marks being left on the planed surface by the aluminum and to minimize the scratching and gouging of the plane sole that was so common on Stanley’s earlier aluminum planes (see Fig. 4). There are no casting marks or numbers on the body of the plane. The front knob is stained hardwood screwed onto a coarsely threaded post on the toe of the plane. The lever cap is nickel plated cast iron with the number “12” and the letter “B” stamped on its inner surface. The lever cap adjusting screw is made from stamped steel. These stamped steel lever cap adjusting screws appeared in the Stanley Full Line catalogs in the mid 1980’s placing this plane squarely in that time period (See Fig 5). 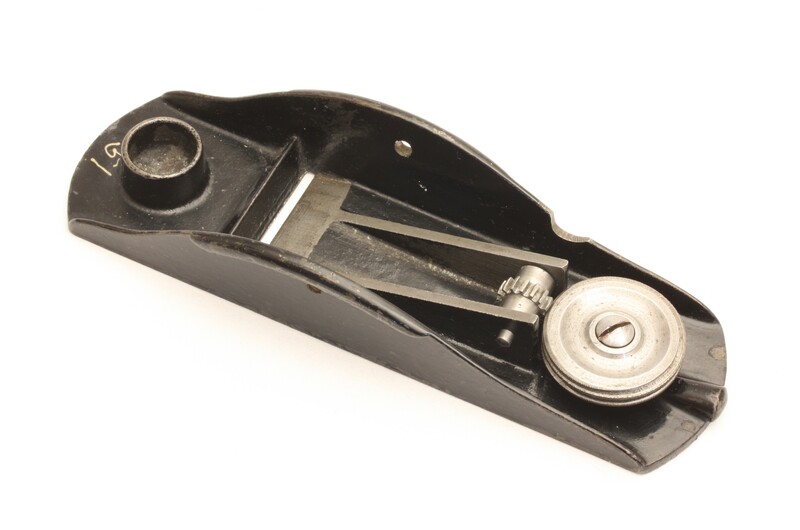 About 1979 Stanley changed the cutter adjusting mechanism and the method of attaching the lever cap on their #220 block plane that they had produced continuously since 1898. (See Fig 6). The cutter adjusting mechanism on the earlier versions of the #220 block plane was based on patent #645,220 awarded to Justus Traut on March 13, 1900. 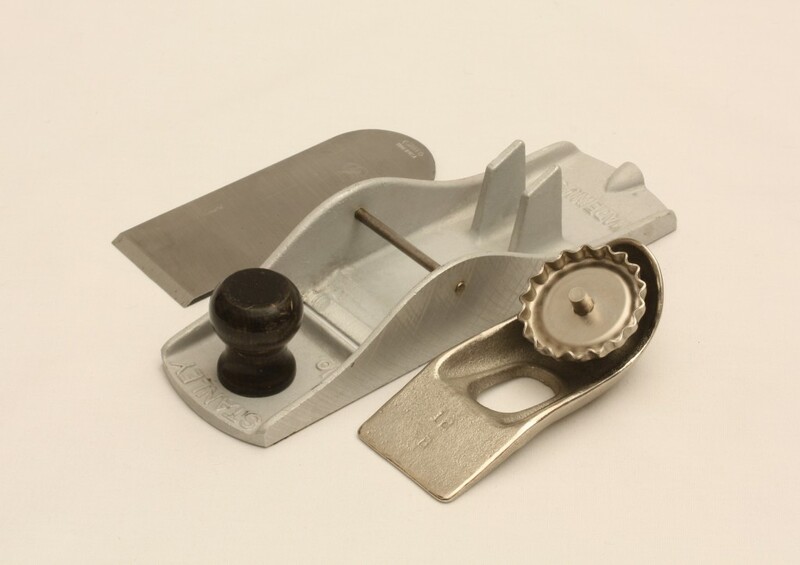 While the adjustment mechanism on the post 1979, #220 block planes looks different, it operates using the same principle as seen on the earlier versions of the plane. A bent strap with a small nib on the forward end is attached to the shaft of the adjustment knob. Corresponding slits in the cutter fit over the small nib. Turning the knob moves the cutter to increase or decrease the depth of cut. It is a surprisingly sensitive adjustment mechanism and works very well. The front knob is stained hardwood . 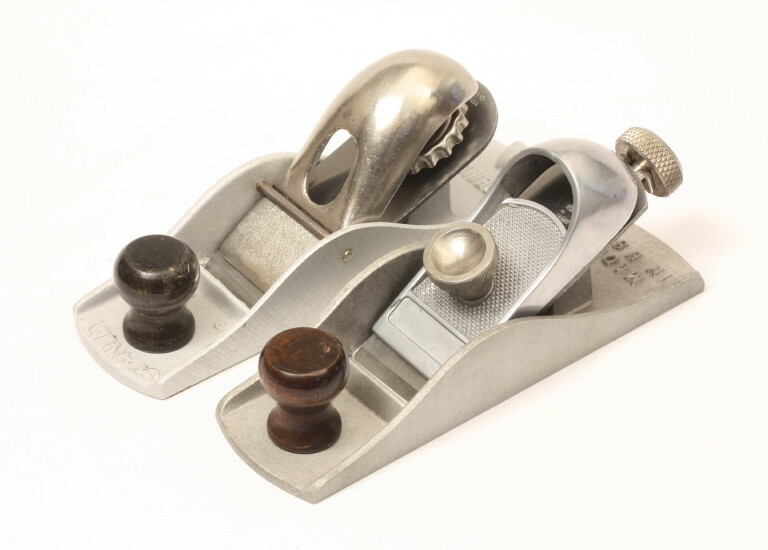 The lever cap on these planes was also different from the lever caps seen on the earlier version of the #220 block plane. 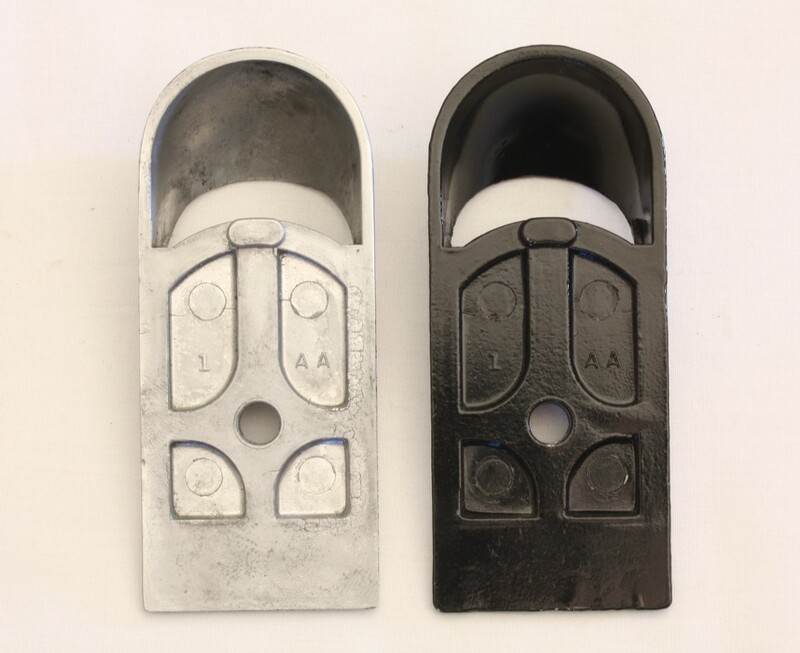 Made of aluminum that was painted black, the lever cap has a hole that fits over a threaded rod screwed into the bed of the plane. Pressure is applied to the cutter by tightening a knurled thumb nut onto the threaded rod. 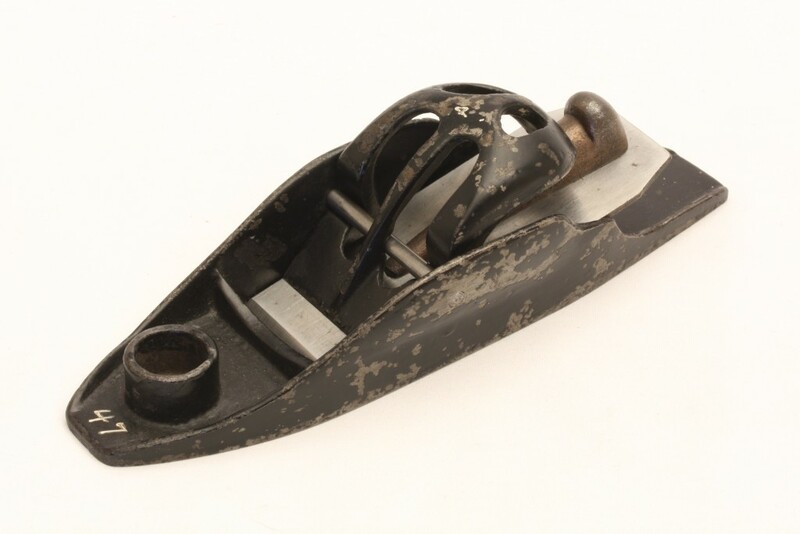 The second aluminum block plane from the Model Shop shown in Figure 7 is identical to the cast iron version of the #220 but is made of aluminum. Like the cast iron version, it is 7 inches long, 2 and 1/16th inches wide and has a 1 and 5/8ths inch wide cutter. 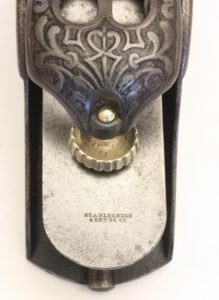 The lever cap is identical to that of the #220 cast iron block plane but it is polished instead of painted and the front knob is stained hardwood that is pressure fitted onto a short post on the toe of the plane (the cast iron version has a threaded post on the toe to accept the front knob, See Fig. 8). The cast iron version has U.S.A. cast in raised letters on the heel of the plane body while the aluminum version has “MADE IN USA” cast in raised letters on the heel of the plane body. 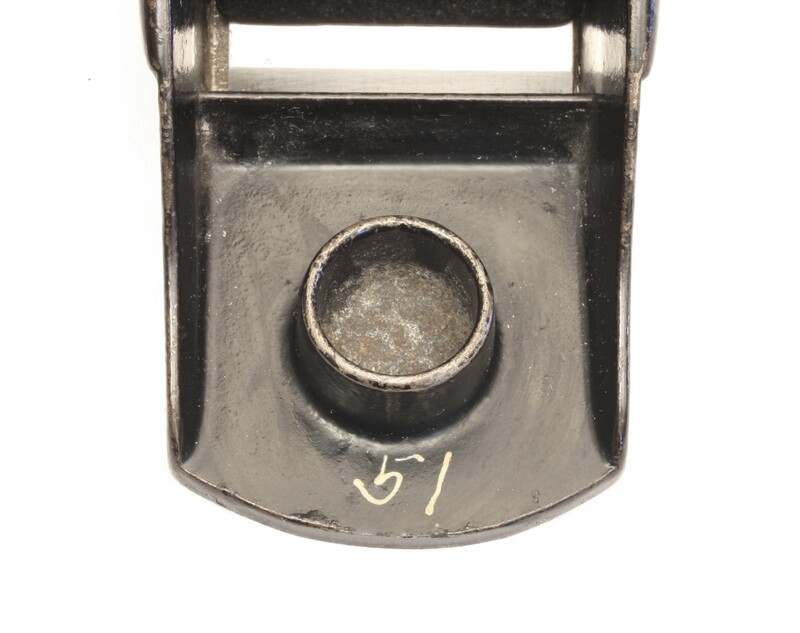 Both lever caps have “1” and “AA” cast into the back of the lever cap but have different casting numbers on the bed of the plane just behind the mouth (see Fig. 9). This plane also dates to the late 1970’s or early 1980’s. Neither one of these planes made it out of the Model Shop and into production. Stanley was actively shifting it’s production of woodworking planes from the United States to England during the decades of the 1970’s thru the 1980’s and didn’t seem to be very interested in producing high quality woodworking planes. These two block planes are in pristine condition and don’t look like they were ever used on a piece of wood. Despite the ongoing shift of plane production to England, the guys in the Model Shop were still active and produced these planes in the U.S. But it appears that the decision makers at Stanley decided that the idea of an aluminum plane was no better in the 1980’s than it was in the 1920’s. And yet, the existence of these two Stanley Model Shop aluminum block planes proves that, “what goes around comes around”. 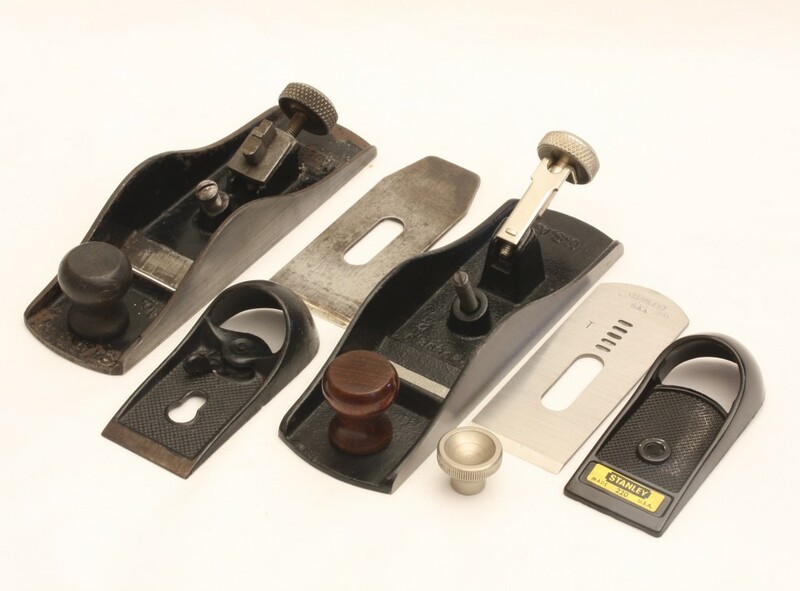 Stanley is still producing both the #110 block plane (first introduced in 1874) and the #220 block plane (first introduced in 1898) and these two block planes have been in continuous production in one form or another since their introduction all those years ago. Heckel, David E., The Stanley “Forty-Five” Combination Plane, Forty-Five Publishing, Charleston, Illinois, 2002, p.77. Original source for this information was microfilmed minutes of the Stanley Rule & Level Company Operating Committee Minutes, April 28, 1915, courtesy of Clarence Blanchard. Heckel’s book is an excellent resource for anyone interested in learning more about Stanley’s combination planes. Dave Heckel has discovered that the earliest listing in a Stanley No. 34 catalog of their aluminum planes was a September 1924 insert that was placed in a 1922 British Edition Catalog No. 34. It shows the A4, A5, A6, and the A 18. The earliest American catalog listings for their aluminum planes were the 1926 Stanley pocket catalog and the No. 34 catalog. This version of the #220 block plane was made for a very short time. It first appears in the 1979/1980 Stanley Tools Full Line Catalog and by 1993 it was replaced by an alternate version of the #220 with a new locking lever cap, slightly different depth of cut adjuster, an added lateral cutter adjuster and a “moulded textured plastic finger grip.” Stanley started shifting the manufacture of woodworking planes from the U.S. to their plant in Sheffield, England starting in 1971. This shift continued and by 1989 all woodworking plane production was done in Stanley’s plant in Sheffield, England. (Many thanks to EAIA member Walter Jacob for providing the information on the shift of manufacturing from the U.S. to England! )T By 2008, Stanley woodworking plane manufacturing once again moved, this time to Mexico. 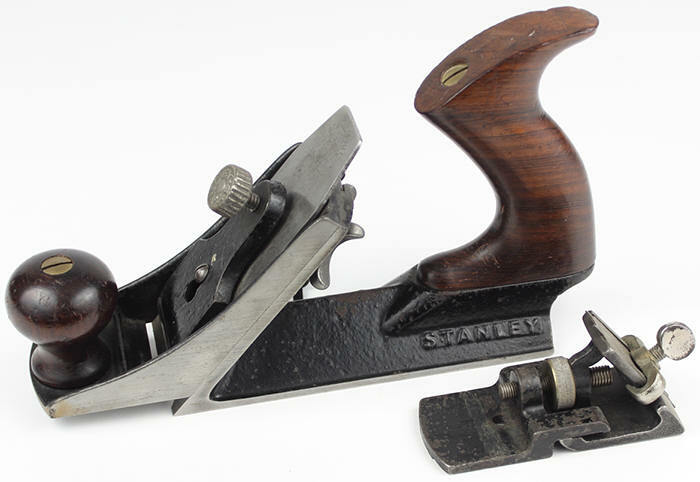 Most Stanley plane users prefer planes made by Stanley prior to World War II. There’s no question that Pam Howard sets a tough example. Teaching, being a mom and wife, traveling, and still finding the time to spin, weave, dye and blog! Down here in deep South Texas time and people move a lot s-l-o-w-e-r (especially in the summer). I’m waiting for the lovely white wool that I will be making into a hat. Meantime, I have been knitting another hat and scarf that I hope will be off the needles by the time I get Pam’s yarn. 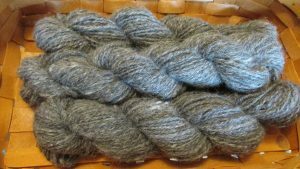 Just off my wheel is the last of a bag of grey alpaca I got from a friend who resurrected it from her stash box and gave to me. I picked and carded it and then spun and two-plied. Since this wasn’t anything “special” or expensive I did a little experiment. After winding off and hanking, I put each of the three hanks into net washing bags and ran them through the washer (horrors, you say!!) on delicate, then hung to dry. They came out a treat! Clean and fluffy. This is alpaca so minimal felting issues to worry about. Weaving-wise I have an empty loom. 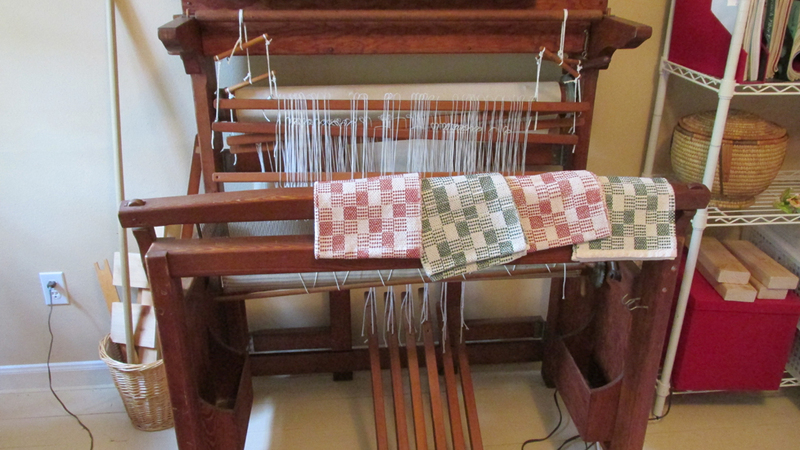 Draped over the Bergman loom are four of the summer/winter towels from the May/June Handwoven. I gave a workshop for my guild/study group on warping b2f recently and warped up about 200 threads of pearl cotton for a scarf. 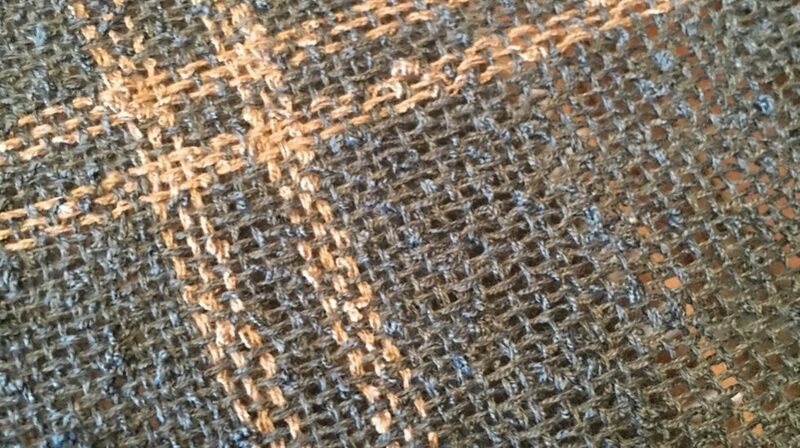 I did an undulating twill that was really cool. Easy peasy to weave and gorgeous when done. It went as a gift to a weaving friend. I snagged a stash off-load at our guild house recently of a two ply knitting cotton, Cassino, which I am laboriously separating into singles and will weave into a plaid. Two ply ready to be separated and re-wound. And another stash add…I was in North Carolina in August and attended a fiber swap meet. 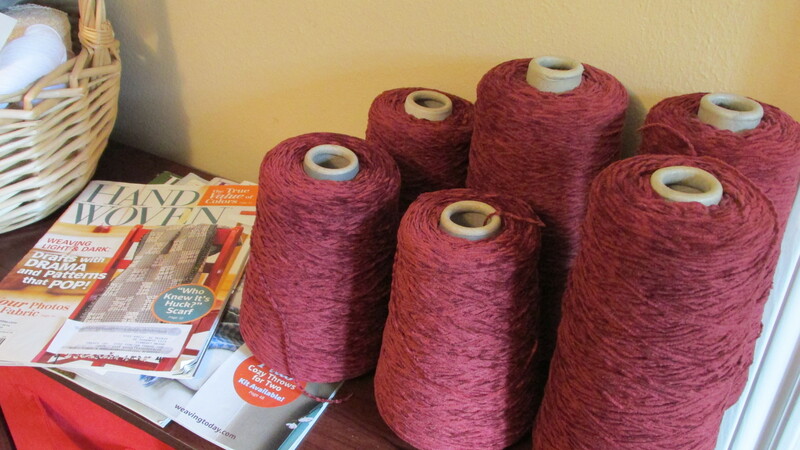 I snagged a bunch of cones of cotton chenille in a cranberry red for a song. Do I sense a Christmas throw in the future??? Stash is like a savings account. Always there for the future. Finally, Patrick and I are hosting a dear friend who recently lost her husband. She has been here since May and will remain until she resettles in another state. She is a knitter, too, so we knit together alot and talk. I will miss her when she is gone. My house gathers dust, laundry is an afterthought, we eat out as much as in. When summer is over I will go outside and see what is left in the yard that hasn’t washed away in the storms or burned up in the heat. I’m looking forward to the EAIA board meeting and Brown’s auction in Harrisburg at the end of October. Can’t wait to see a tree that changes color and experience temps below 90! Oh yeah, and see my fiber buddy, Pam Howard! Keep spinning! It has been three months since we had our first EAIA Fiber Interest group meeting. It was great to see such an enthusiastic group of fiber artists. Summer has been very busy but I have managed to get some weaving, dyeing, and spinning done. 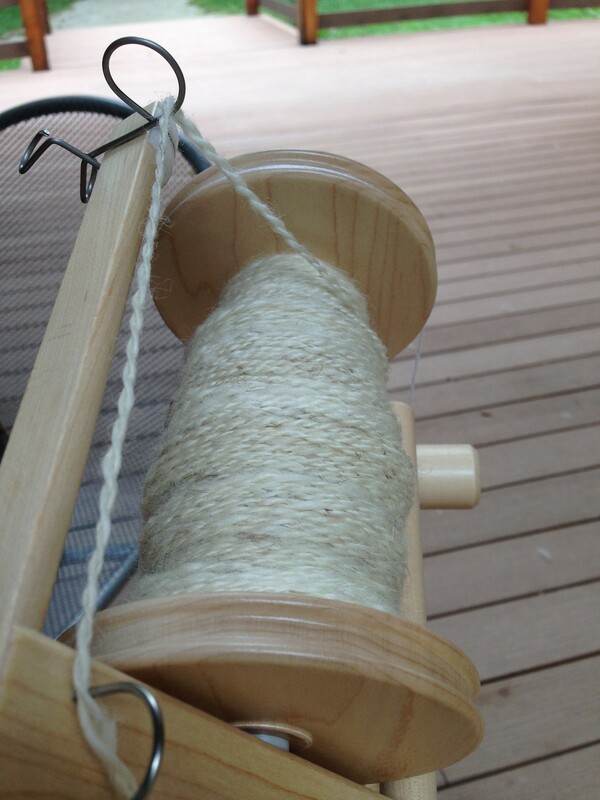 Speaking of spinning there is a fun project that has been brewing since our stay at Pleasant Hill Shaker Village that you might be interested in. 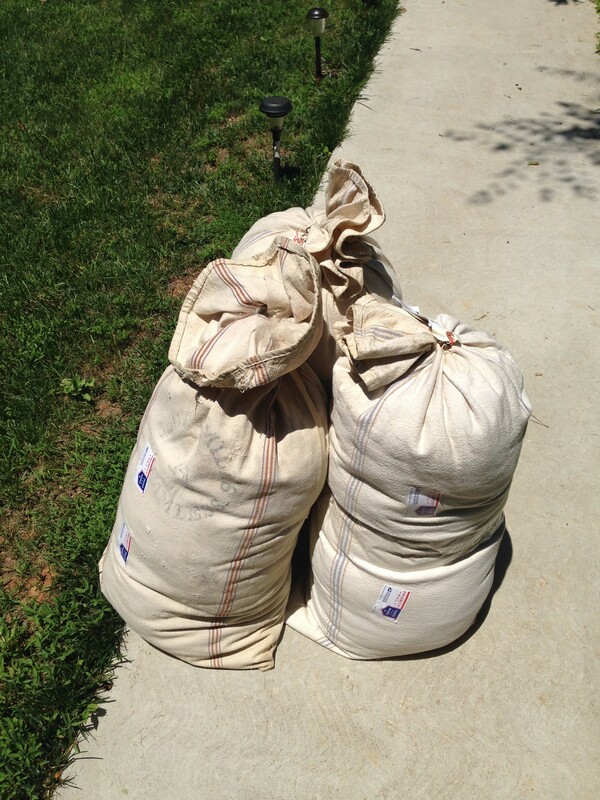 Three cloth bags of wool. One of the nice things about our annual meetings is we get to meet other EAIA members. My husband and I were staying in the West Family Dwelling. So were several other folks from all over. Gwenn and Pat Lasswell and Dianne and were staying there as well. Gwenn was knitting, I was spinning some of Gwenn’s Jacob fleece and Dianne was putting a puzzle together. Soon the three of us were chatting about this and that. Dianne was curious about my spinning on my new wheel. Soon told us about how she had several Shetland cross sheep on her farm in Pensalvaina. She explained that she had sheared the sheep in the spring and had all of this wool. Of course, being the teacher in me, I said…” well you need to learn to spin.” Diane said she was not interested in learning to spin, but would I like to have the fleece ? I said ……Sure! About three weeks later I hear a honking outside my house. My mail lady was calling me out to her car and said, you have mail!. Oh yes, I did, three bags full. Big cloth bags crammed full of wool. Oh my, I was thinking a small box of wool that I could wash and card in no time. Well, this was 13 1/2 pounds of mostly white wool. That is quite a lot of wool for one spinner ( me ) to skirt, wash, pick and card, let alone to spin. What was I going to do with all of this wool? I got it! I will talk to my “fiber partner in crime” Gwenn Lasswell. 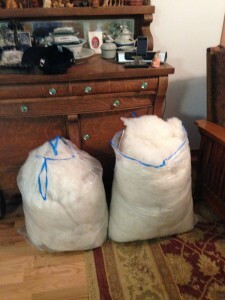 The once 13 1/2 pound of dirty wool is now about 9 1/2 pounds of clean wool. Gwenn listened as I told her about the wool that Dianne had sent me. 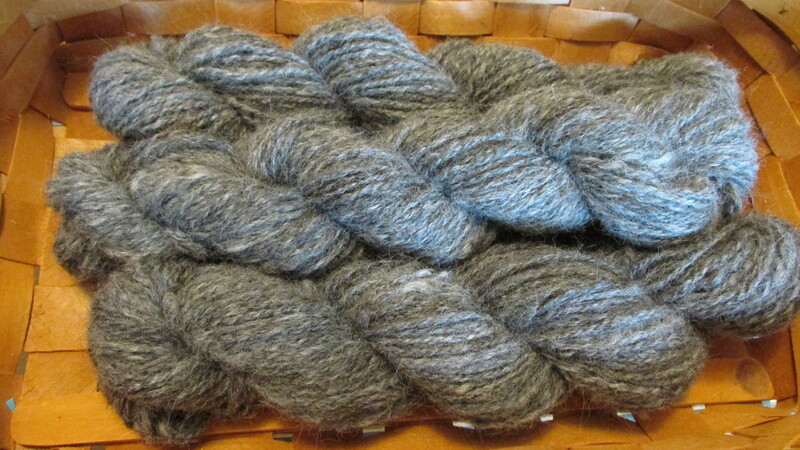 I also said that the wool needed to be skirted, washed and at least picked so that it would be spun. I then told her about my idea for part of this wool. Why not have a group fiber project. 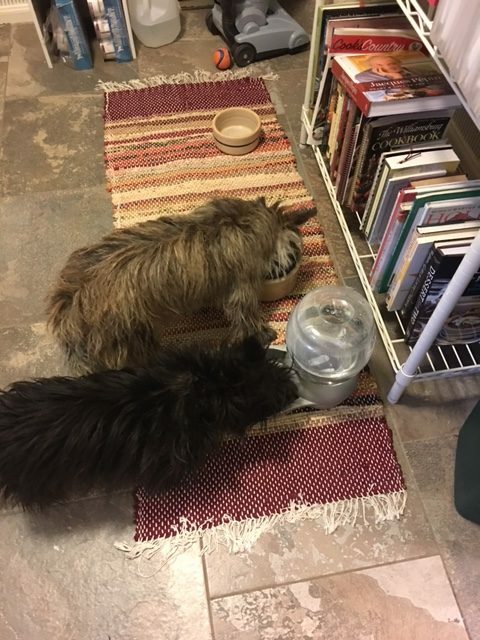 Dianne has donated the wool, I have it professionally cleaned and will spin a portion of it and Gwenn will spin additional yarns from this wool. After the wool is spun, Gwenn will knit a hat and I will weave a scarf. Then both pieces will be donated at our next EAIA Annual Meeting Silent Auction. 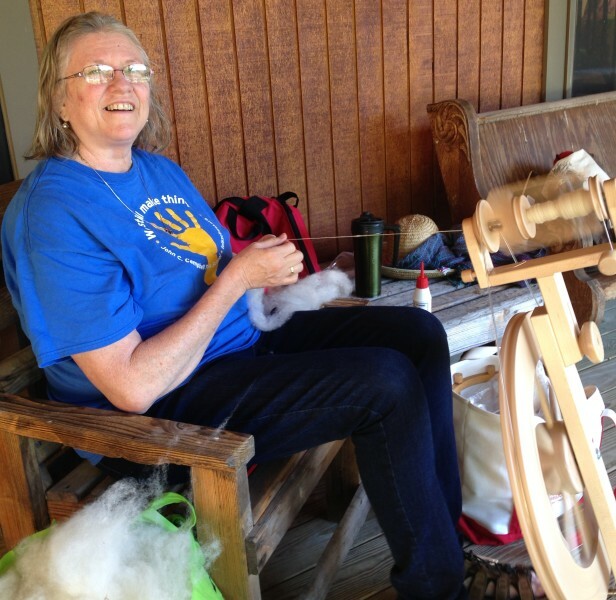 I started spinning my portion of wool last month when I accompanied my husband Ron on a trip. Ron took a week long advanced blacksmithing class and I just spent my time spinning on the wool project. 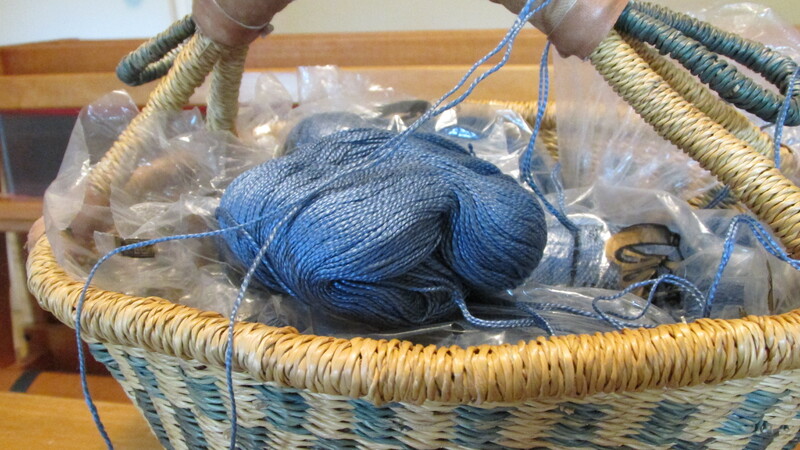 I am not sure if I am going to dye my yarn yet, but if I do I will most likely use natural dyes. All white is nice, but I sure do like more color in my life. Not sure what Gwenn is going to knit with her contribution of spun wool, but I bet it will be wonderful. There is still almost 8 months till the next EAIA Annual Meeting. I hope sharing this blog post will peak your interest about our little adventure. 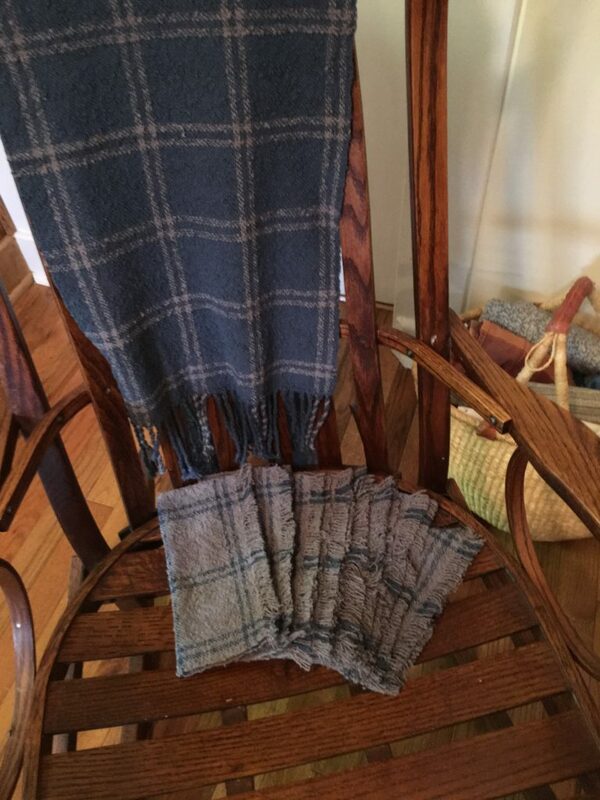 It might make you more incline to come and join in on the fun at the annual meeting and better yet come and bid on these two hand-made fiber items. Hey get busy other members and try to work up a fun collaborative project for the silent auction. It really can be fun!! !